As noted in several previous articles, this is a very important stronghold for the bulls. If support does not manage to hold this support, the market will undoubtedly search lower values in an attempt to garner significant market demand. Previously, I discussed the possibility of the recent move to $8,400 as a so-called Sign of Strength (SoS). Typically, a SoS would like to see an approximate 50% retracement for it to be considered a healthy, bullish move. However, in our case, we saw a 100% retracement. The chart above shows just how dominant the sellers were on this latest shove. You see next to no buyers stepping in as the volume and price spread continue to expand on its path to the local bottom. Although the overall volume trend is consolidating, it is pretty clear that sell pressure is still very present relative to the recent bullish rally. This can be a sign that we will, indeed, be testing lower values for support if the current price level does not hold. The next major level of support exists around the green box shown in the chart above — the 78% retracement of the entire bull market. The consequence of having such a strong, parabolic run up in the previous bull market is that there were no pit stops to establish support for quite a ways below our current price level. I expect, if the current support does not hold, the move will be violent and will occur in a very short period of time. Granted, this is all up in the air, but once again we find ourselves at the mercy of the TR support in the lower $6K values. The market is currently showing signs that supply is still present and demand is lacking much momentum to move the price. Immediately after having a very strong couple weeks of buying, the market immediately retraced 100% of its move in just 10 days. The retracement failed to see any demand step in as the price dropped 25%. The market is, once again, testing the support of the TR bottom. If the TR support does not hold, we can expect to see the price quickly test the mid $4k range as it attempts to find support. Cryptocurrency mining chip maker Bitmain hopes to raise $18 billion for an IPO in the coming months, according to documents obtained by CoinDesk. If the company raised $18 billion at a market capitalization of $40 to $50 billion, that could make it the largest IPO in history. In June, Bloomberg reported that Bitmain was planning to go public to further its pursuits in producing hardware for artificial intelligence technology. The world's largest producer of cryptocurrency mining chips, Bitmain, is planning to file for an initial public offering in September, according to documents obtained by CoinDesk. According to the documents, CoinDesk reports Bitmain's proposed public offering could end up being the largest in history: The company reportedly hopes to raise $18 billion IPO on the Hong Kong Stock Exchange at a market capitalization of $40 to $50 billion. While Bitmain's primary industry has been producing integrated circuit chips used to algorithmically "mine" cryptocurrencies like bitcoin, the company recently began to manufacture chip hardware for the artificial intelligence industry. 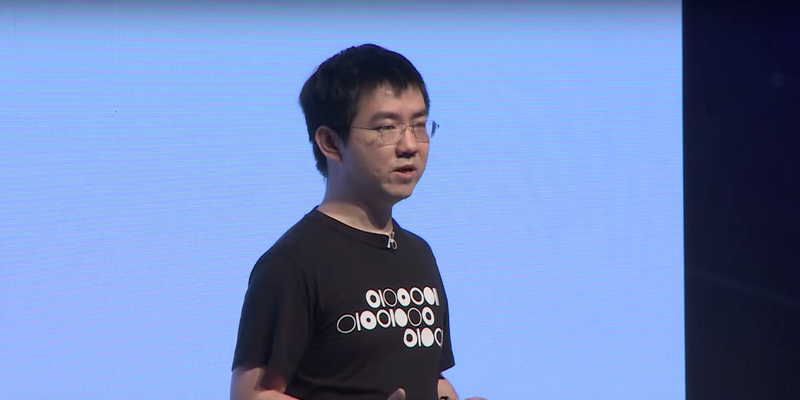 Bitmain is headed up by 32-year-old Jihan Wu, who founded the Beijing-based company only five years ago with the vision that digital currencies would be the de facto money of the future. In June, Bloomberg reported that Wu was considering taking his company public and that Wu plans to position Bitmain as a ruthless competitor in the circuit chip industry. So far, Wu's pursuit has proved overwhelmingly successful: In the few short years since it was founded, Bitmain has become one of the world's most valuable cryptocurrency companies. In the first sixth months of 2018 alone, the company raked in $2.5 billion in revenue, according to Bloomberg. The company has received $450 million in funding from investors including Sequoia, GIC, and IDG Capital. Bitmain did not immediately respond to a request for comment on any IPO plans. In June, the Trump administration ordered countries to stop importing Iranian oil by November. Iran sanctions could make it "very challenging" to maintain global supply, the IEA said Friday. Crude prices rebounded Friday amid expectations for US sanctions against Iran, which would cut off oil imports from the country, and a rise in global demand. 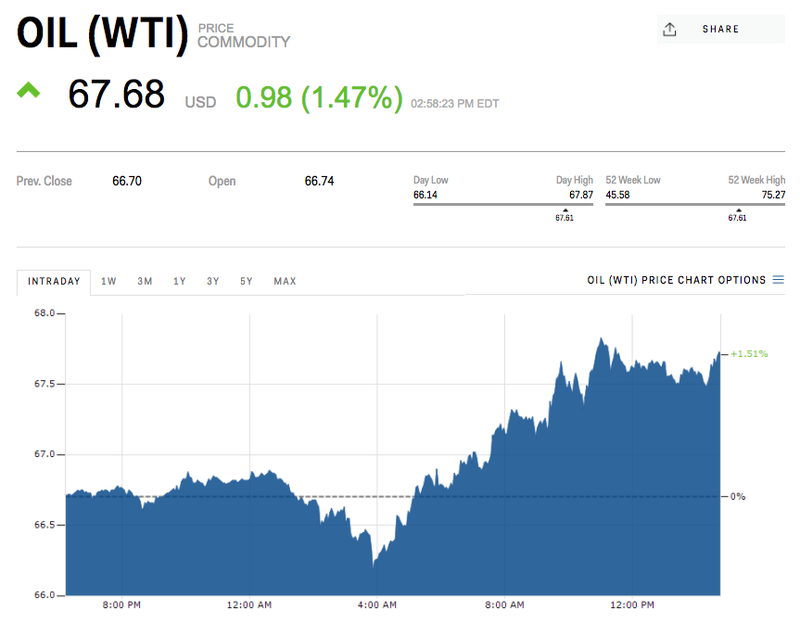 West Texas Intermediate crude jumped 1.3% after the International Energy Agency said in a report that planned US sanctions against Iran, the world's fifth-largest producer, could threaten global oil supply. Brent, the international benchmark, rose 1.15%. 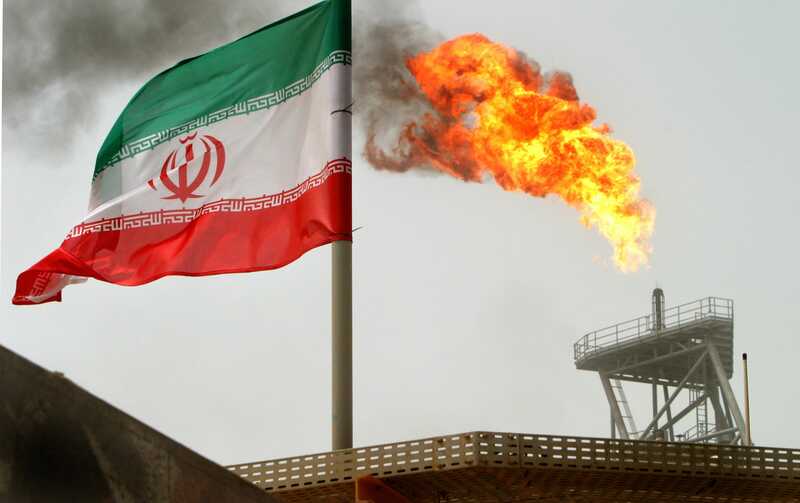 "As oil sanctions against Iran take effect, perhaps in combination with production problems elsewhere, maintaining global supply might be very challenging and would come at the expense of maintaining an adequate spare capacity cushion," the agency said. President Donald Trump announced in May the US would withdraw from the deal among world powers, which offers sanctions relief in exchange for restraints on Tehran's nuclear weapons program. Some of those sanctions on metals and cars were reimposed this week. Oil is expected to be hit in the next round of sanctions, which are scheduled to take effect in November. In June, the State Department called on buyers to stop importing Iranian oil by that time or risk facing US sanctions. Analysts estimate that could put more than two million barrels per day at risk. But with opposition from other signatories of the Iran deal, especially European allies, FXTM strategist Hussein Sayed said it's becoming difficult to guess how many barrels will be off the market by November. It also is not clear if the State Department would allow sanction waivers, which were used in the Obama era to wean the world off of Iranian oil and avoid supply shocks. Administration officials have said they might look at requests on a case-by-case basis, while also maintaining that the goal is to cut Iranian oil imports to zero. At the same time, global demand appears poised to rise. The IEA raised its 2019 forecast for oil demand growth around the world by 110,000 barrels a day to 1.5 million barrels. Turkey's currency crisis has lurched on to the global stage, denting European and US stocks as fears of contagion rise. The country's economy was already in trouble, but the lira's selloff was heavily compounded by Donald Trump's announcement that he was doubling tariffs on Turkish steel and aluminum. The boomerang market effect showed just how interconnected the global economy and markets remain, making it difficult for Trump to pursue an isolationist stance, and for the Fed to continue raising interest rates. Turkey’s currency crisis spilled loudly on to the global stage Friday as other markets, including US stocks, took at hit from concern about financial contagion to other countries and banks. Turkey’s troubles, compounded by a new round of US sanctions, are unlikely to cause any kind of permanent hit to US markets or its economy, but it does offer two cautionary tales, one for President Donald Trump and the other for Federal Reserve Chairman Jerome Powell. For Trump, it shows just how quickly his "America First" isolationist agenda can bite back. There are already ample signs that Trump’s aggressive anti-trade rhetoric is dampening global economic activity as trade wars heat up and even risk morphing into currency wars. Trump further frayed US-Turkish relations after the president announced via Twitter that he was doubling of tariffs on exports of steel and aluminum from the NATO ally, shoving the Turkish lira down 18% in one day alone to a record low against the US dollar. As a result of the ensuing panic, the dollar strengthened sharply against major currencies as global investors sought a safe-haven, something that runs directly against Trump’s professed efforts to boost US manufacturing production and exports. And what about the Fed, which is expected to keep raising interest rates as early as next month? While many of Turkey’s challenges are specific to that country, there are certain characteristics — a heavy debt load following a prolonged, low US interest-rate driven borrowing binge in dollars — broadly shared throughout emerging markets. South Africa’s rand took a sharp hit on Friday, over heightened worries that country might be next to face similar troubles to Turkey, like high inflation, an overheating economy and a lack of credible central bank independence. While Fed officials are quick to stress they are focused on the domestic economy, any emerging market slump large enough to spill over into Europe or the United States would be significant enough to give policymakers pause about ongoing monetary tightening. That's particularly true given US inflation has just hit its target after a prolonged undershoot and wage growth that remains stagnant. Tesla is in early discussions with some potential investors about the possibility of taking the company private, Bloomberg reports. According to the publication, the company is looking for a number of investors, rather than seeking a few, large stakeholders. The report appears to contrast with tweets from Tesla CEO Elon Musk on Tuesday, in which he said funding to take the company private was "secured" and indicated that a shareholder vote was the final step needed to finish a deal. According to Bloomberg, sources close to 16 financial firms and technology companies were not aware of backing that was arranged before Musk sent his first tweet. Tesla did not immediately respond to Business Insider's request for comment. According to the publication, the company is looking for a number of investors, rather than seeking a few, large stakeholders. Tesla has begun discussions with some potential investors and is talking with banks about the whether it will be able to make a deal and what that deal might look like, but it hasn't hired a bank to formally assist in the process, Bloomberg reports. The report appears to contrast with tweets from Tesla CEO Elon Musk on Tuesday, in which he said funding to take the company private was "secured" and indicated that a shareholder vote was the final step needed to finish a deal. According to Bloomberg, sources close to 16 financial firms and technology companies were not aware of backing that was arranged before Musk sent his first tweet. Three days after Musk said he had locked down the funding necessary to take Tesla private, pending a shareholder vote, neither he nor the company has disclosed where that money could come from. "Am considering taking Tesla private at $420. Funding secured," Musk said on Tuesday via Twitter before issuing a formal statement on Tesla's website. "Investor support is confirmed. Only reason why this is not certain is that it’s contingent on a shareholder vote," he later said. While Tesla's board released a statement on Wednesday saying Musk had discussed the prospect of going private with them last week, Reuters reported on Thursday that Musk had yet to tell the board where the backing for a buyout deal would come from, citing a source familiar with the matter. Musk's failure to clarify his tweets indicating Tesla is a shareholder vote away from becoming a private company is a problem, James Rosener, a partner at the law firm Pepper Hamilton who specializes in private equity and corporate financing, told Business Insider. "The fact that there has been no announcement clarifying, confirming, or denying the financing is surprising and puts Tesla and Musk at great risk," he said in an email. That risk includes the possibility of fines from the Securities and Exchange Commission, or even criminal prosecution, said Harvey Pitt, who served as SEC chairman from 2001 to 2003. "This whole course of events is highly problematic," he said. The Wall Street Journal reported on Wednesday that the SEC made an inquiry into Tesla about whether one of Musk's tweets regarding the possibility of taking the company private was truthful. And on Thursday, Bloomberg reported that the agency was "intensifying" its inquiry. An inquiry from the SEC does not necessarily mean an investigation will follow. Read Bloomberg's full story here. The regulators have awoken. SEC Director William Hinman introduced novel concepts to the securities law analysis such that sellers of digital assets may have an escape valve. Yes, even if their initial sale triggered securities laws, later sales may not. The industry should not move forward without careful exploration of these concepts. First order of business: Can digital assets change their colors? As outlined by Global Digital Finance, a digital asset can be a financial asset token (potentially coded as a security), a payment token (Hinman used the term “coin”), or a consumer token (Hinman used the term “token”). The relevant question is not whether an asset can change its token type, but whether the latter two types — a “coin” or “token” in Hinman’s words — can ever become securities. Director Hinman’s discussion of Scotch proves instructive. The SEC director carefully teased out a distinction between a consumer item and its manner of sale. The ultimate takeaway: Whisky is never a security, but its sale can trigger securities laws. It would be ridiculous to say whisky morphs into a security because of how it is sold; it always remains a non-security consumer item. Replace “whisky” with “coin” or “token” and the logic remains sound. It makes no sense, then, to say a consumer or payment token can morph into a security. That is, unless the code itself changes such that the code itself represents stock or another type of security instrument. This is more than semantics; precision matters. Following the above logic, developers need not fret about doing their job. So long as a developer creates a consumer or payment token, the developer does not create a security or anything that can morph into one. Activity outside of coding will be what makes securities laws applicable. This distinction should give comfort to the builders out there. Code without worry. Activity outside of coding will be what makes securities laws applicable. Anyone who wants to sell, however, should worry. The sale may inadvertently trigger securities laws. Purchasers in any sale will form expectations. The sales process must manage these expectations so that buyers do not think they will profit from the managerial efforts of others. Director Hinman’s remarks provide some principles to follow for anyone attempting a “coin” or “token” sale that rests outside of the securities regime. Keep these in mind when planning your sale. Build something real, something useful. The Howey analysis weakens when purchasers consume what they buy. A network with real use looks less like it involves an investment contract. The following facts indicate your buyers intend to consume tokens on your network: marketing targets actual users, buyers represent they will use tokens, buyers have purchase limits, and buyers have no financial incentive to hodl. Any network with node participation and geographic distribution at least as distributed as the Bitcoin network should be considered sufficiently decentralized. Reward volatility may vary for small miners without making the network insufficiently decentralized. The presence of centralized mining power (even up to 61 percent of weekly mining power split between three miners) does not make a network insufficiently decentralized. The presence of powerful core developers or an influential foundation does not make a network insufficiently decentralized. An open-source, proof-of-work network may be sufficiently decentralized at inception. All this counsels toward creating a global, well-distributed network. How to further measure decentralization, especially at genesis or for proof-of-stake or delegated proof-of-stake networks, remains an open question ripe for a no-action letter request. Hinman argued that decentralization correlated with a reduction in information asymmetry between promoter and purchaser. Yet decentralization and information asymmetry may coexist where only a small set of developers actually understand changes made to a decentralized network. Disclosure helps, but does not resolve, the asymmetry. Only consumer education can. Disclosure helps, but does not resolve, the asymmetry. Only consumer education can. The suggestions above align surprisingly well with core philosophical tenets held by proponents of decentralization. But without clarity on “sufficient decentralization,” all token sales risk violating securities laws. Fortunately, the SEC has expressed willingness to work with industry participants. Companies should take advantage of this rare offer to shape how securities laws will apply for the foreseeable future. This is a guest post by Josh Garcia, Principal at Ketsal Consulting, the stratecig consulting arm of blockchain-focused law firm Blakemore Fallon. Opinions expressed are his own and do not necessarily reflect those of Bitcoin Magazine or BTC Inc.
Christopher Rollins, a 16-year veteran of Goldman Sachs, sued the bank this week over his termination. Rollins claimed he was unfairly terminated over his role in a series of transactions involving an unnamed financier who had legal issues in the past. He's seeking $50 million in damages. The lawsuit set tongues wagging on Wall Street and in the City of London, given that it names several of Goldman Sachs' most senior staff in London. Multiple people familiar with the matter believe the financier in question is German entrepreneur Lars Windhorst, who's been referred to as Germany's "modern-day Medici." Mike Sitrick, a spokesman for Windhorst, said in an emailed statement that “we strongly deny that the unnamed executive mentioned in the lawsuit is Lars." A lawsuit Thursday sent Wall Street and the City of London buzzing, including mentions of a whistleblower, an unnamed "notorious European businessman," and a handful of Goldman Sachs bankers, one of whom is a member of the incoming CEO's inner circle and others known internally as the Aussie mafia. Christopher Rollins, a managing director and 16-year veteran of the bank, sued the firm over what he alleges was an unfair termination over his role in a series of transactions involving a financier that he didn't name, according to the suit which seeks $50 million in damages. The complaint names Jim Esposito, promoted this week to co-head Goldman's securities division, as a defendant, and details the involvement of Goldman bankers Michael Daffey and John Storey, and other leaders. The suit talks about a number of transactions that Goldman conducted on behalf of the financier, who had legal issues in the past, according to the complaint. Windhorst, chairman of a firm called Sapinda, is said to be a protégé of former German Chancellor Helmut Kohl. In the past, he's filed for bankruptcy and been involved in numerous legal battles. In 2012, an article in Financial News referred to him, approvingly, as Germany's "modern-day Medici." According to the complaint, the entire affair started when Daffey and Storey met with the financier in 2015 to explore ways the firm could bring him on as a client. 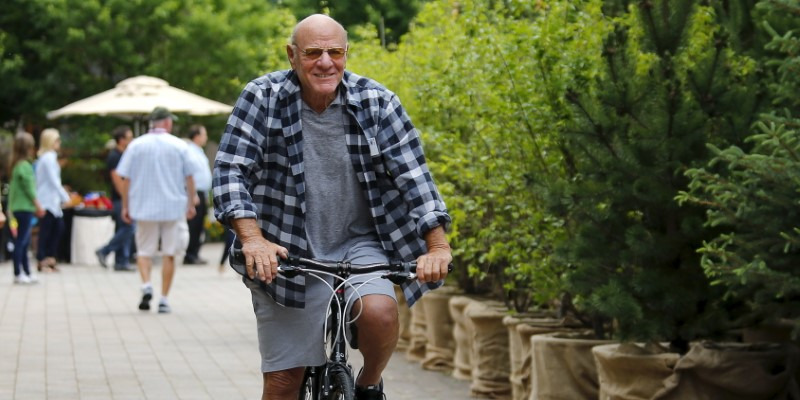 The two are among the most senior members in Goldman's equities business. The FT reported that Storey attended the infamous President's Club dinner in London earlier this year where the newspaper has reported that women servers were groped and propositioned. Daffey was also on the President's Club invite list, though the firm has said he didn't attend. Hailing from Australia, they are known by some internally as the Aussie mafia, according to some people who know them. Michael DuVally, a Goldman spokesman, declined to comment on the characterization, and neither exec returned phone calls seeking comment. The complaint alleges the financier told the bankers that he had $1 billion to invest. Rollins claims that while he had met the financier socially he'd never sought to do business with him. Here's what we can ascertain about the timeline of alleged events, based on the complaint. August 2015: Daffey and Storey allegedly travel to Windhorst's 200-foot yacht in the Mediterranean to pitch for his business. Part of the deal would be working with what the complaint called an "obscure" brokerage with ties to the financier. September 2015 to August 2016: Daffey, Storey and former vice chairman Michael Sherwood allegedly "used their influence within the firm" to steer a series of transactions around the firm's compliance controls, according to the complaint. Issued $1.2 billion of bonds ($700 million in September 2015, and then $500 million in June 2016) structured by an unnamed broker affiliated with the financier, the complaint says. Incidentally, the Financial Times has previously reported about transactions involving the sale of two bond issues totalling $1.2 billion on behalf of several special purpose vehicles. The funds went for loans to airlines around the world, including Abu Dhabi-based Etihad, Air Berlin and Alitalia. A broker called Anoa Capital, in which Windhorst's firm, Sapinda Group, had purchased a stake in 2013, helped arrange those deals, according to the September 2017 article. Opened an account in New York for the financier. Opened a second account, in London, to execute a single trade worth more than $400 million in July 2016, earning $7 million in fees. While an internal committee initially rejected the trade, it was approved after Daffey appealed to Richard Gnodde, a Goldman vice chairman, according to the complaint. Incidentally, Reuters reported in July 2016 that Windhorst's firm, Sapinda Group, used Goldman Sachs to help it sell a 19% stake in an Austrian real estate firm named Buwog for about $400 million. Exhibit 1 of the complaint mentions a Buwog transaction. Goldman also executed a series of trades for securities in a second European company that were sold to some of the bank's other clients. August 2016: One of the Goldman clients that agreed to buy a stake in the second European company couldn't come up with the money, leaving the bank on the hook for $85 million. September 2016: Goldman compliance execs interview Rollins and tell him that he should not have had any contact with the financier. Rollins alleges, further, that the firm began "a Kafkaesque disciplinary process, pressuring Rollins to confess to violating compliance restrictions relating to the Financier—even though the Firm could never identify any actual restrictions." He further claims, the complaint says, that Daffey, co-chief operating officer for the equities unit, and Storey, co-head of equity sales for the region, told Rollins they had "arranged" for Esposito to be the decision-maker and that he would be a “friendly arbitrator,” according to the complaint. Rollins alleges that Daffey told Rollins that if he "didn’t fight the charges, and was 'contrite,' he’d receive no more than a slap on the wrist." Rollins claims in the complaint that he didn't do anything wrong. That filing is part of Rollins' employment record, known as a U5, kept by the Financial Industry Regulatory Authority. Rollins's record also includes his rebuttal: "In March, Goldman Sach & Co filed disclosures information on my U-5 which I believe is inaccurate and plan to contest." 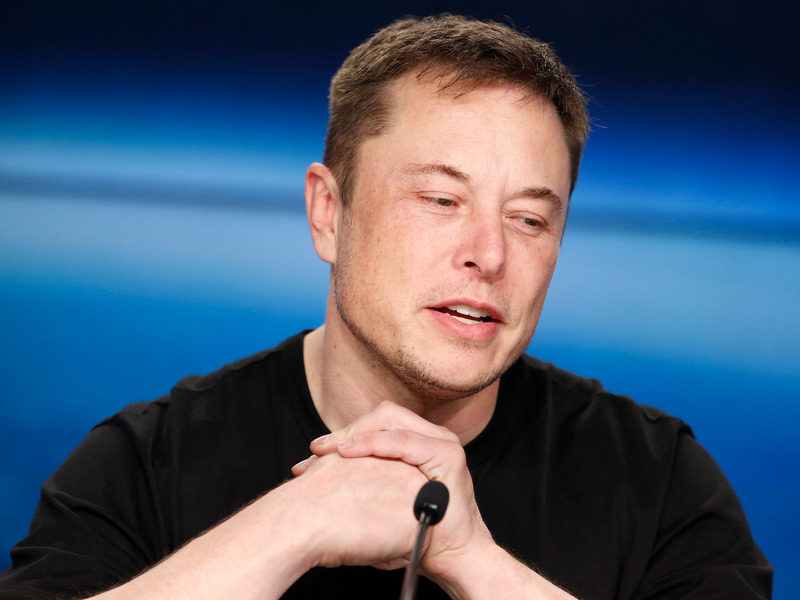 The SEC is reportedly inquiring into a tweet from Tesla CEO Elon Musk about the potential for the company to go private. An inquiry from the SEC does not necessarily mean an investigation will follow, but if the agency does determine one is necessary, it will start by looking at a tweet Musk posted on Tuesday, Harvey Pitt, a former SEC chairman, told Business Insider. If Musk is found guilty of misconduct, potential punishments could range from hundreds of millions of dollars in fines to criminal prosecution. Nearly three days after Tesla CEO Elon Musk said he had secured the funding necessary to take Tesla private, pending a shareholder vote, neither he nor the company has disclosed where that money could come from. One possible explanation: Tesla and its board of directors don't know. That risk includes the possibility of fines from the Securities and Exchange Commission, or even criminal prosecution. An inquiry from the SEC does not necessarily mean an investigation will follow, but if the agency does determine one is necessary, it will start by looking at the tweet that has put Musk under intense scrutiny, according to Harvey Pitt, who served as SEC chairman from 2001 to 2003. Tesla's share price surged after the tweet, rising by as much as 12%, to over $381, before trading closed. According to Pitt, mentioning the possibility of taking Tesla private on Twitter, while ill-advised, will not trouble regulators. Instead, it's the tweet's final two words, "Funding secured," that could create problems. '''Funding secured' is a very strong term and it has legal consequences," Pitt said. If the SEC launches an investigation, it will determine if, at the time Musk made that tweet, he had a legally-binding commitment that would provide enough funding to convert Tesla into a private company at $420 per share. The agency will also look at the veracity of the statement Tesla later posted to its website and whether the company should have made additional statements based on what it knew. The agency will be able to answer those questions relatively quickly, but its second potential area of inquiry, Musk's intent with his tweets, will be more challenging, Pitt said. Musk could be punished if the agency proves he tweeted about a buyout not because he had a deal in place, but because he wanted to punish short-sellers — who bet against a company's stock — knowing his statement would likely increase the price of Tesla shares. Proving that would be a difficult task, in part because Musk had previously expressed his desire to take Tesla private. "I wish we could be private with Tesla," Musk said in an interview with Rolling Stone published in November 2017. "It actually makes us less efficient to be a public company." But Musk has been open about his disdain for Tesla short-sellers. On multiple occasions, he's hinted at an event he said will "burn" them. "Short burn of the century comin soon," he said in May via Twitter. "The sheer magnitude of short carnage will be unreal." "They have about three weeks before their short position explodes," he said on June 17. To determine Musk's intent with his tweets on Tuesday, the SEC would look at his internal communications before and around the time he sent the first tweet, Pitt said. If Musk had expressed to anyone that he wanted to take revenge on short-sellers, or if he was told not to tweet about a potential go-private deal while markets were open, he could be found guilty of market manipulation. That's a difficult charge to prove, Pitt said, and ultimately, any punishment Musk or Tesla would receive would depend on the amount and strength of evidence the SEC found. For Musk to be criminally prosecuted and sent to prison, wrongdoing would have to be proven beyond a reasonable doubt. For less severe penalties, the SEC would have to determine it was more likely than not that Musk committed some form of misconduct, Pitt said. If it did, its punishments could range from inflicting hundreds of millions of dollars in fines on Musk or Tesla to barring Musk from ever serving as an officer or director for a public company again, according to Pitt. Whether or not Musk's actions lead to an SEC investigation, his conduct this week has been highly unusual, putting Tesla and its shareholders in an increasingly difficult position. "This whole course of events is highly problematic," Pitt said. Global markets are in turmoil on Friday, with a historic plunge in the Turkish lira at the center of the chaos. 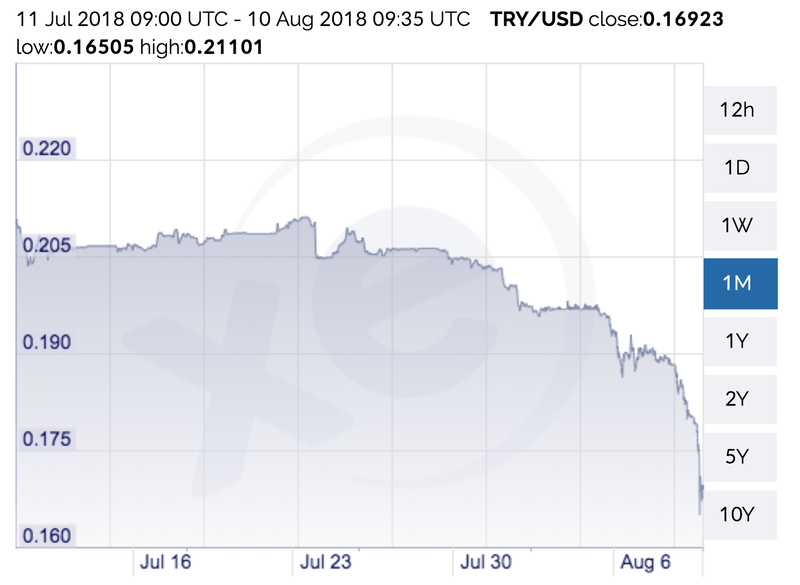 The lira's decline caps a week of political news that's unnerved investors, as the US ramped up sanctions on Turkey and Russia and as the United Kingdom fretted over a so-called no-deal Brexit. US investors shifted focus from strong corporate earnings to the rout in Europe, sending the major stock-market indexes lower. Watch the lira trade in real time here. Turkey is front and center of the chaos on Friday, with its currency plunging to a record low against the US dollar. A diplomatic tussle between the US and its NATO ally deepened Friday after President Donald Trump said he had authorized the doubling of tariffs on Turkish steel and aluminum. and it may well trigger a banking crisis," Andrew Kenningham, the chief global economist at Capital Economics, said in a note on Friday. These fears spilled over into US markets, with investors shifting their focus away from strong corporate earnings to what was happening across the Atlantic. The Dow Jones industrial average was down 280 points, or 1.1%, at 2:30 p.m. ET, while the S&P 500 was down 26 points, or 0.94%. The tech-heavy Nasdaq composite was down 83 points, or 1.1%, poised to end an eight-day winning streak. This week, the Turkish lira has fallen 23% against the dollar, losing nearly a quarter of its value. Ankara and Washington have been at odds over the detention of the American evangelical pastor Andrew Brunson on terrorism charges, a matter that Trump has discussed directly with Turkish President Recep Tayyip Erdogan over the phone, The New York Times reported. 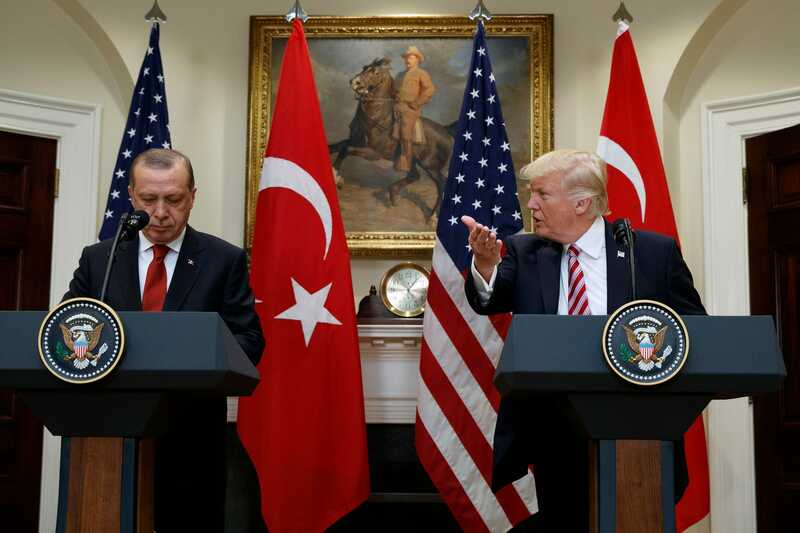 The US on August 1 imposed financial sanctions on its NATO ally, blocking Turkey's ministers of justice and interior from doing business with Americans. 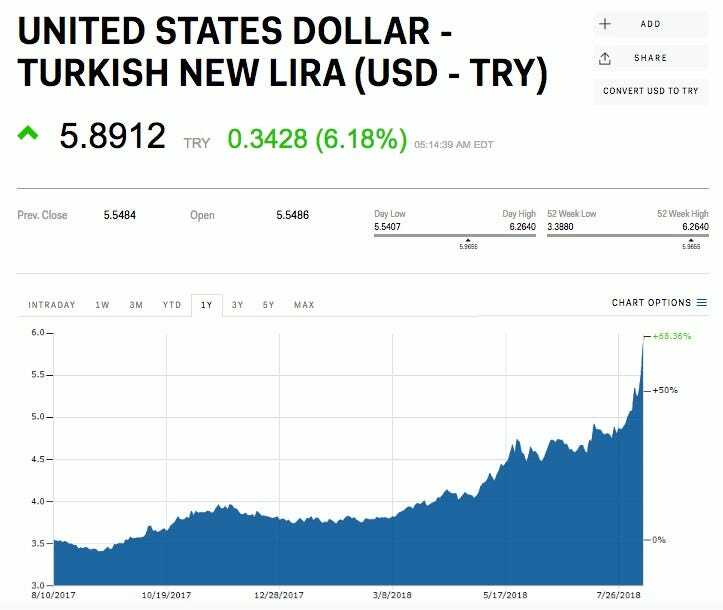 The diplomatic tension and the failure of Turkish officials to persuade the US to lift the sanctions plunged the lira to new lows this week. The currency's slide deepened early Friday, after the Financial Times reported that the eurozone's chief financial watchdog was concerned about how some of Europe's biggest lenders would be affected by a crisis in Turkey. The lira stumbled even more as Erdogan delivered a wild speech to supporters about the plunging currency, encouraging Turks to buy it up. "Don't forget," he said, "if they have their dollars, we have our people, our God." The final gut punch to the lira came after Erdogan's speech, when Trump tweeted that he had "just authorized a doubling of tariffs on steel and aluminum with respect to Turkey." More evidence of how nervous investors are about Turkey's economy could be seen in the iShares MSCI Turkey exchange-traded fund, which plunged 18% and saw the most premarket trades ever, according to Bloomberg. 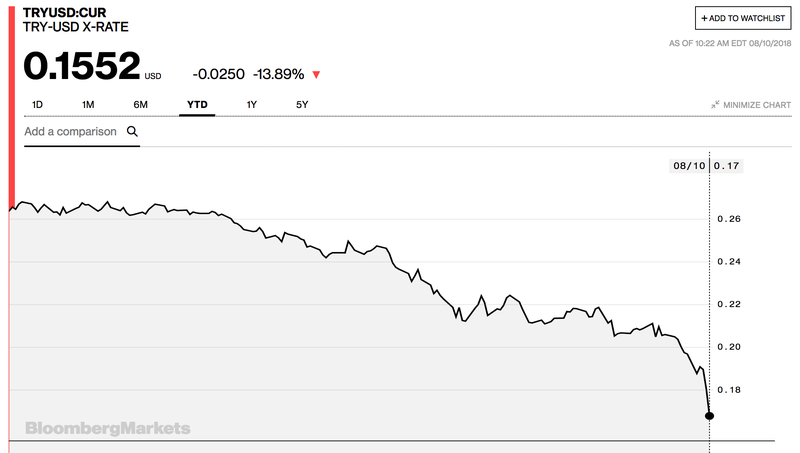 The pound also nosedived this week. And like with the lira, investors found new reasons on Friday to dump the currency. Its sell-off was based on rising fears that Britain would leave the European Union without a deal, with less than eight months to go before the planned exit date. "The possibility of a no-deal at the moment is uncomfortably high," Bank of England Governor Mark Carney said during a radio interview last week. A stronger dollar has also put more pressure on the currency. The dollar index, which measures its strength against a basket of other developed-nation peers, hit its highest level since June 2017 on Friday. Investors were already grappling with what a no-deal Brexit would mean for the continent. According to Barclays, they have pulled $51 billion from European funds since early March, wiping out the inflows of 2017. On Friday, they also had to also factor in Turkey's economic crisis. 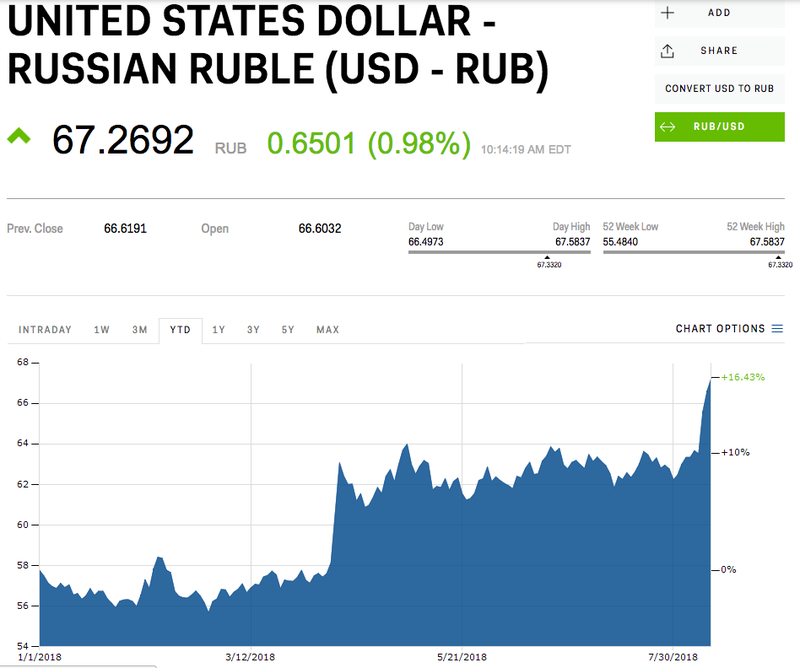 The Russian ruble this week plummeted to its lowest level against the dollar since 2016 as the US said it was imposing more sanctions on Moscow over a chemical attack in the UK earlier this year. The announcement intensified fears that US sanctions on Russia may not recede anytime soon. The ruble has lost 17% of its value against the dollar this year. Russia struck back Friday, with Prime Minister Dmitry Medvedev saying that any move to rein in Russian banks or their foreign-currency dealings would be "economic war." The fact that great responsibility accompanies great power has become crystal clear in the blockchain world. While blockchains are most commonly connected with commerce, the potential impact of distributed ledgers is being discovered in fresh sectors daily. 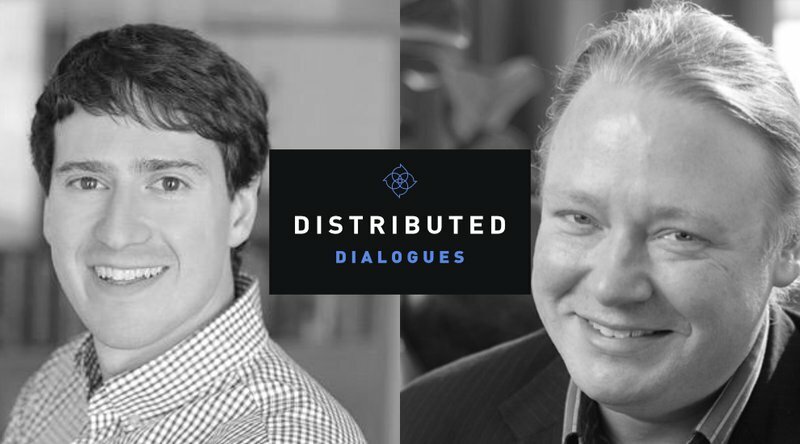 In the most recent episode of the Distributed Dialogues podcast, a collaborative show between the Let’s Talk Bitcoin Network and Distributed Magazine, blockchain’s better side was on display. The show explored three different perspectives on how the technology is being used, not just to raise crypto value, but to help humanity rise up. Alex Gladstein, chief strategy officer at the Human Rights Foundation (HRF), explained that organization’s optimism about blockchain technology. HRF is a nonpartisan, nonprofit organization that promotes and protects human rights globally, with a focus on closed societies. According to Gladstein in his interview with the show’s co-host Rick Lewis, about 90 countries, with a total population of about 4 billion people, currently lack the checks and balances that a more open society would have. Gladstein believes that decentralized models such as blockchains and cryptocurrencies can make a world of difference for this large population whose rights are routinely violated. It’s part of a nascent field he calls “demtech,” short for “democracy tech,” and its development comes with an unexpected bonus. Brian Behlendorf is the executive director of Hyperledger, the umbrella project of open-source blockchains which is striving to support collaborative development for blockchain technology. As a primary developer of the Apache Web server, Behlendorf’s influence has spanned the web for decades. His role as a founder of the Apache Software Foundation has also established him as a long-time advocate of the open-software community. Behlendorf strikes a balance between the responsibilities that should be designated to machine and to man, in his interview with Distributed Dialogues co-host Dave Hollerith. “We can’t give up the need to find ways, as humans, to make decisions together,” Behlendorf pointed out. “And so, I think the more of governance, the more of business processes that we can make algorithmic and auditable using blockchain technology, in addition to lots of others, the better off we’ll be, because the more fair, potentially, we’ll have the application of those rules to society. Blake Burris and Kylen McClintock of Flux, a new protocol for facilitating environmental data, spoke with segment host Tatiana Moroz. Flux is a self-described “proof of impact” play which dedicates 10 percent of its allocations to impact projects to scale the protocol. According to the Flux website, it is deploying a sensor data network targeted at improving marketplaces and supply chains for agriculture, livestock and aquaculture. Its success, or proof of impact, will be measured by its ability to create partnerships that end desertification, stabilize crisis zones, integrate with micro-finance programs and help farmers increase their profitability. “It’s really about those insights that can be derived from that mass data set, and paying on a pro rata basis back to those who contributed that data,” added Burris. In recent months, Facebook's blockchain team, led by former PayPal executive David Marcus, has met with open source payments technology company Stellar about some of those opportunities, people familiar with the talks told Business Insider. 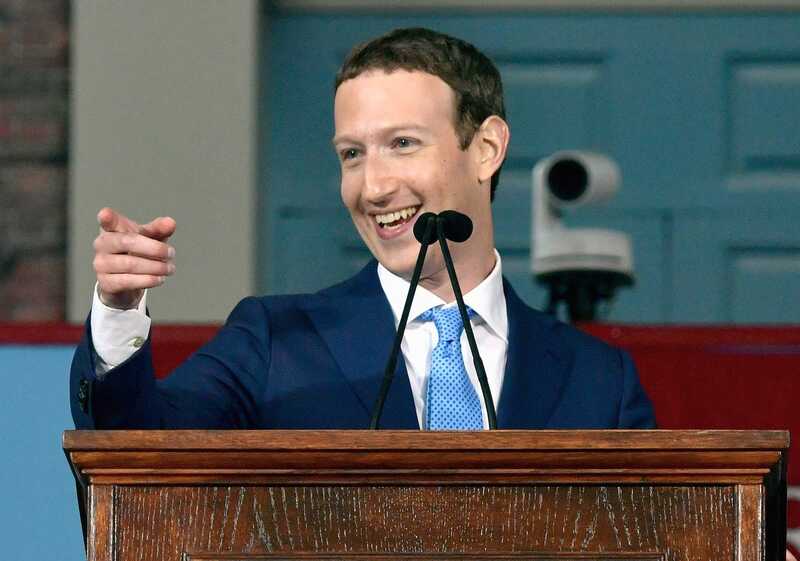 While the talks were early stage, they could shed light onto Facebook's ambitions to push into finance and take on big banks. In Silicon Valley, startups valued at $1 billion or more are nicknamed "unicorns" because originally they were so few and far between. USDA raised its outlook for soybean production. Prices have been under pressure amid the US-China trade war. Watch soybeans trade in real time here. 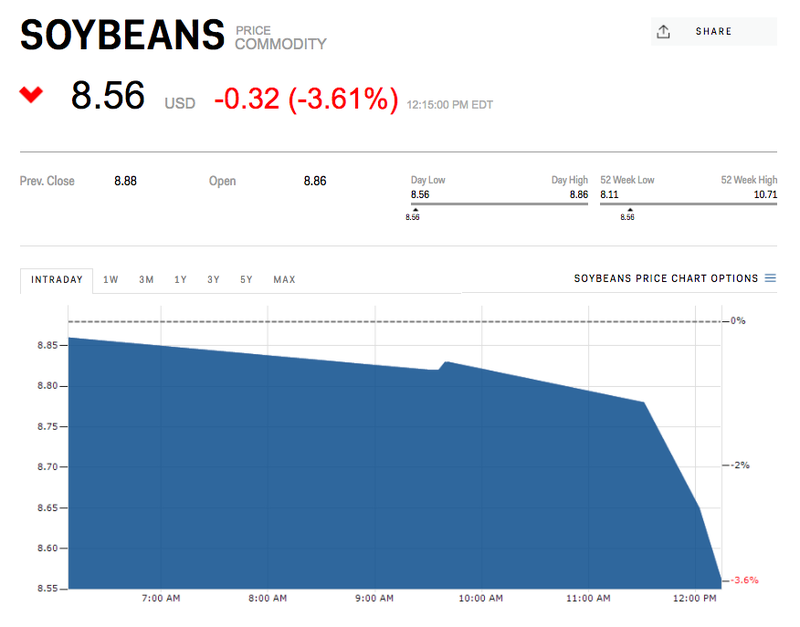 Soybean futures fell Friday after the US Department of Agriculture boosted its outlook for harvests. Prices fell 2.5% to $8.65 a bushel at 12:45 p.m. ET. Soybean prices have been under pressure amid an ongoing trade war between the US and China, the world's largest soy importer. The countries have imposed tariffs on roughly $50 billion worth of goods each and threatened to slap additional duties on nearly all products they trade. 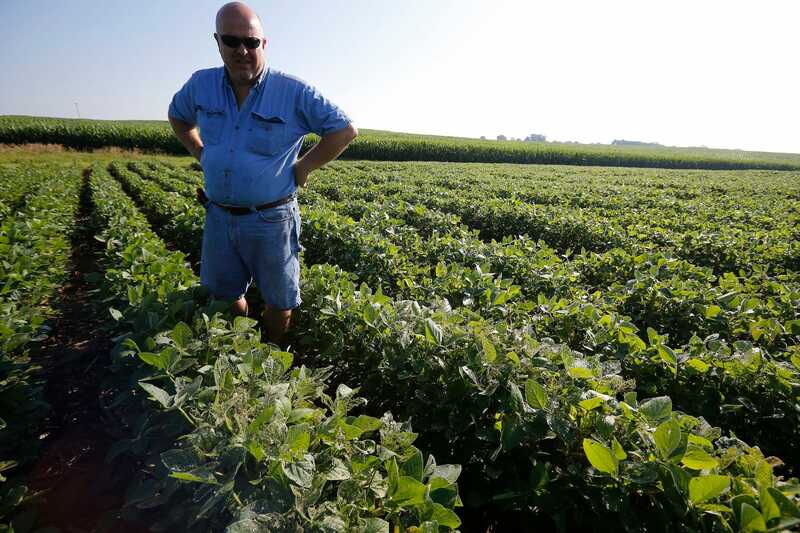 The US tariffs against China include a 25% import tax on soybeans, making American soybeans more expensive for one of its biggest customers. China has since been trying to reduce domestic reliance on American soybeans by lowering trade barriers with other exporters of the legume. In recent months, Facebook's blockchain team has met with open source payment technology company Stellar about some of these opportunities, people told Business Insider. Facebook could use blockchain technology to rival big banks' payments network. The tech firm has big ambitions for its blockchain group, with a recent job ad saying the group "is a startup within Facebook, with a vision to make blockchain technology work at Facebook scale and improve the lives of billions of people around the world." In recent months, Facebook's blockchain team, led by former PayPal executive David Marcus, has met with open source payments technology company Stellar about some of those opportunities, people familiar with the talks told Business Insider. While the talks were early stage, they could shed light onto Facebook's ambitions to push into finance. For example, if Facebook wanted to rival the big banks' payments networks, it could leverage blockchain technology to do so, a person familiar with the firm's talks with Stellar said. The speed of certain blockchains over traditional financial pipes-and-plumbing is one of the most cited benefits of the red-hot technology. A JPMorgan research note said that the speed of a transaction on Ripple's network took four seconds versus the three to five days it takes for traditional banking systems to process a transaction. Facebook is already taking other steps to break into banking. The company is reportedly considering showing users their bank balance or potential fraud alerts. 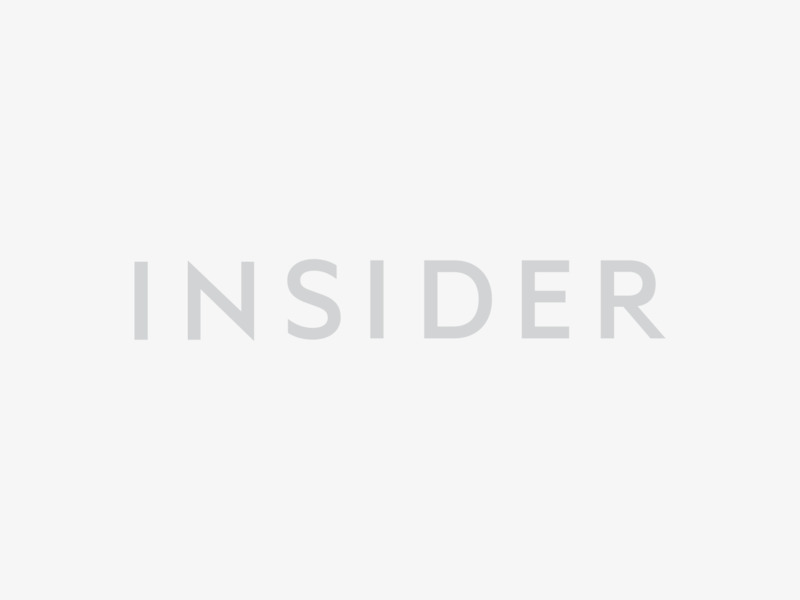 A Stellar insider told Business Insider it would make sense for Facebook to record payments transactions onto a distributed ledger like Stellar. Other merchants could then connect to a Stellar-based ledger. This platform could rival the SWIFT Payments network that now connects banks together and allows for money transfers. "They'd be taking the rug out from under the banks," the person said. "They can add a bank more quickly than a bank could build a social network." Sources say Facebook and Stellar have spoken about the firm potentially forking the main Stellar network as part of its blockchain efforts. A crypto fork is when a blockchain splits into two — both have the same underpinnings but can be managed differently moving forward. Facebook is known for working with other open-source technologies, being one of the largest maintainers of React, an open-source technology language. It could in theory fork an existing blockchain as opposed to building its own. A spokesperson for Facebook disputed that the company would build on Stellar's technology. A spokeswoman for Stellar declined to comment. A source close to Facebook's blockchain business said the company is making a long-term bet on blockchain that will likely resemble its investments in artificial intelligence. Rather than targeting a specific vertical, such as payments, Facebook's blockchain group would provide a foundation from which the firm will be able to target an array of possible opportunities. A recent Facebook job ad reflect this notion, saying the blockchain group "is a startup within Facebook, with a vision to make blockchain technology work at Facebook scale and improve the lives of billions of people around the world." The firm is also looking to expand its crypto group, according to job ads. One position the firm is looking to fill is manager position for a newly created software engineer team within the blockchain group. Facebook is also hiring a blockchain public policy manager to analyze policy issues relating to blockchain and advise product and business teams on those developments. Already, Shashwat Gupta, a former product manager for Samsung Pay, joined as a product strategist for blockchain in May. 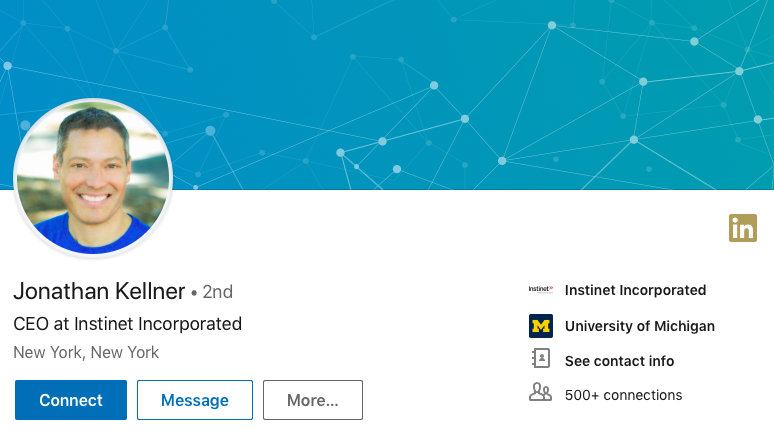 Blockchain was removed from his LinkedIn profile after Business Insider talked to a Facebook spokesman. And Evan Cheng recently was promoted to head of engineering for blockchain in June. The duo joined existing Facebook employees including Kevin Weil, a VP of product, and James Everingham, head of engineering, blockchain. A new way to trade bitcoin and digital currencies is now in the books. 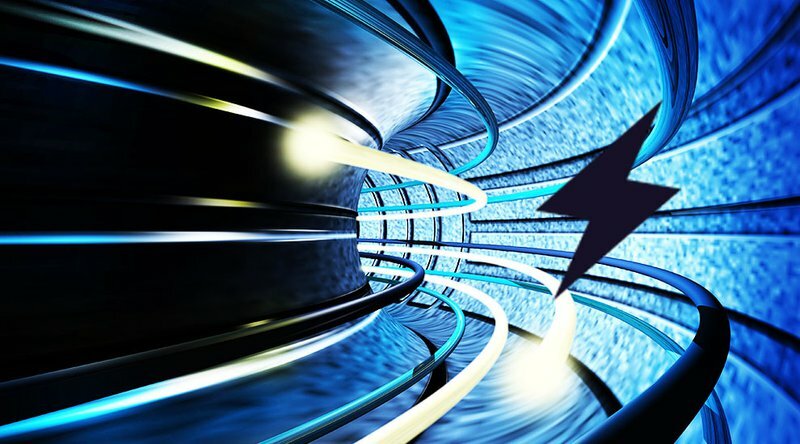 SparkSwap is the first crypto exchange to be built on the Lightning Network. It allows users to trade both bitcoin and altcoins in seconds without depositing assets with a third party. In a blog post, SparkSwap founder Trey Griffith said, “You can trade between different blockchains (currently Bitcoin and Litecoin, with others coming soon), with trades settling in about a second — a transaction time comparable to some of the leading centralized cryptocurrency exchanges. SparkSwap is made up of two primary components. The first is called the Broker and is the software run by users. It interprets user actions and converts them into network actions. It also executes payment channel network swaps and manages user wallets and private keys. The second component is known as the Relayer, which is software run by staff members. It connects brokers who wish to execute monetary swaps; provides orderbook updates; and mitigates fraud and market manipulation. The Relayer also assists users with agreeing on swap prices and executes trades over payment channel networks like the Lightning Network, which eliminates the need for third parties. Crypto enthusiasts once believed that the Lightning Network was limited strictly to bitcoin, though this isn’t necessarily the case. For the longest time, bitcoin and altcoin exchanges occurred through processes known as atomic swaps where, if one individual wanted to trade altcoins for bitcoin while another sought to trade bitcoin for altcoins, they could trade by submitting two transactions: one to the bitcoin blockchain and the other to the respective altcoin blockchain. The bitcoin from the second individual is sent to the first, who can then claim it, granted he reveals a secret number as part of the on-chain claim-transaction. This secret number, in turn, lets the second individual claim the altcoin on its respective blockchain. This prevents fraud from either end, while ensuring each party receives their respective funds. Even though the process worked, it was also a hassle. The Lightning Network improves on atomic swaps by connecting not two blockchains but two payment channels, which can allow multiple parties to trade back and forth without trusting one another. The Lightning Network can also be used to send transactions across different blockchain platforms, thereby permitting currencies to change owners off-chain. The result is a trustless environment in which currencies can move about without recording the transactions on specific blockchains. Griffith claims that SparkSwap works by utilizing the same trustless processes over the Lightning Network. He also says that while there is still more work to be done, the system is ready for public use, as staff members are eager to witness the community’s reaction and improve upon the technology from there. “We’d like to be helpful if we can,” he states. Contagion will be limited — the Turkish economy just isn't that big. LONDON — "The plunge in the lira, which began in May, now looks certain to push the Turkish economy into recession and it may well trigger a banking crisis." That's the first, alarming, sentence in a note from Capital Economics' chief global economist Andrew Kenningham that was sent to clients on Friday. But don't worry too much, he adds. The Turkish economy is so small that there is little chance of global contagion, of the kind we saw with the Greek debt crisis or the US real estate market in the 2000s. Still, Turkey and Spain look likely to take serious hits, Kenningham says. The Turkish lira lost 14% of its value vs. the US dollar at the time of writing on Friday. It has declined 34% since the start of the year. Previously, Turkey's economy had been growing at a healthy clip of about 7% a year. But with foreign money running for the exits, the country is now entering a crisis. 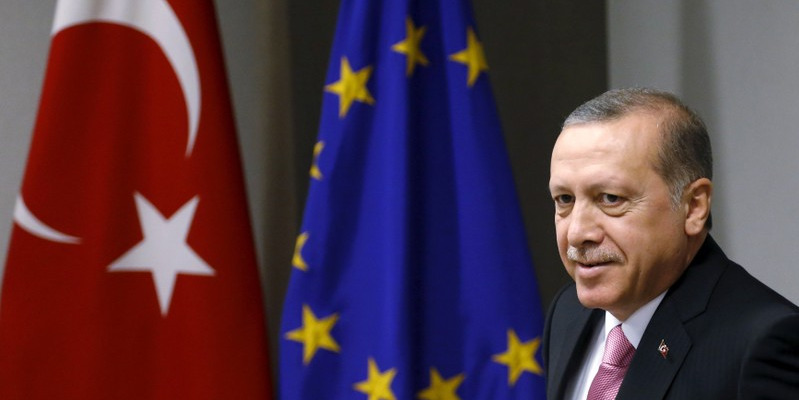 President Erdogan may not have a full grasp of his central bank's ability to stem the damage. The immediate problem for Turkish banks is that many of the assets they hold are loans made in foreign currencies. As the lira declines in buying power, those loans are becoming more expensive for customers to pay back — and that could mean widescale defaults. On its own, that would not be much of a problem (unless you are Turkish). With "GDP of around $900bn, Turkey’s economy accounts for just one percent of the world economy, at market exchange rates, which is slightly smaller than the Netherlands," Kenningham told clients. Spain, however, has a particular problem. Kenningham writes: "Spanish banks’ exposure to Turkey is equivalent to around 6% of Spanish GDP, much of which is due to BBVA’s stake in Turkey’s second largest private bank." 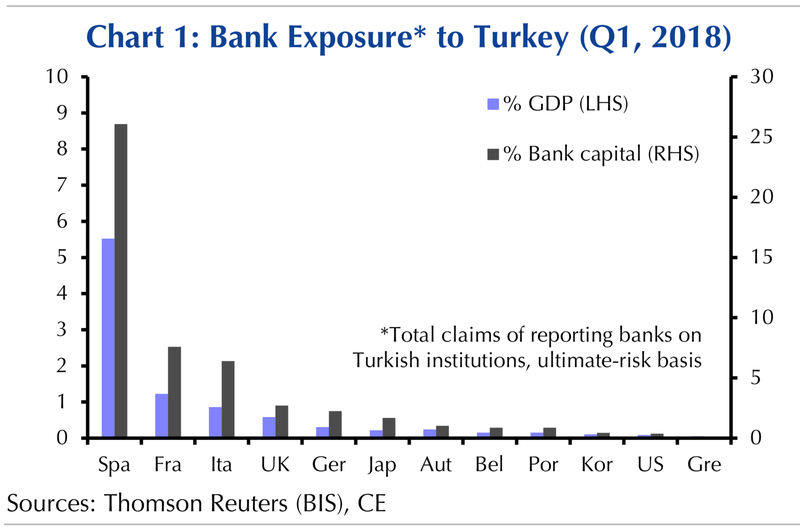 About 25% of BBVA's bank capital is exposed to Turkey, according to Capital Economics. BBVA stock was down 6% on the news. BBVA (Spain) owns just under half of Garanti Bank. BNP Paribas (France) holds 72.5% of TEB. Unicredit (Italy) has a €2.5 billion investment in 40.9% of Yapi Kredi. Follow the Turkish lira vs the US dollar on Markets Insider. Pay TV provider Dish Network, one of the first big firms to accept bitcoin payments, has announced it now also accepts bitcoin cash. Jonathan Kellner, the CEO of Instinet, is expected to step down from the broker later this year, according to people familiar with the matter. Former Goldman Sachs trading executive Ralston Roberts is cited as a potential replacement, the people said. The chief executive officer at Instinet, the agency broker owned by Japanese investment bank Nomura, is preparing to step down later this year, according to people familiar with the mater. Instinet CEO Jonathan Kellner joined the company in 2007 as its head of US sales trading and took on the top position at the firm in 2014. Recently, Financial News reported that Ralston Roberts, a electronic trader executive from Goldman Sachs,was joining Instinet as chief operating officer. Roberts is cited as a potential replacement for Kellner, the people said. A spokesperson for Instinet declined to comment. Elsewhere at Instinet, the firm has been scooping up a number of former KCG employees, including William Wiley, as head of strategy; Brian Bulthuis, as an executive director; and Denise Fiacco in the quant trading strategy group. Many of those hires were part of a broader effort at the firm to broaden its focus on quant research and development to improve the quality of trade execution. Instinet provides algorithmic trading products, trading analytics, and other execution services, working out of offices in New York, London, San Francisco, Edinburgh, and Hong Kong. 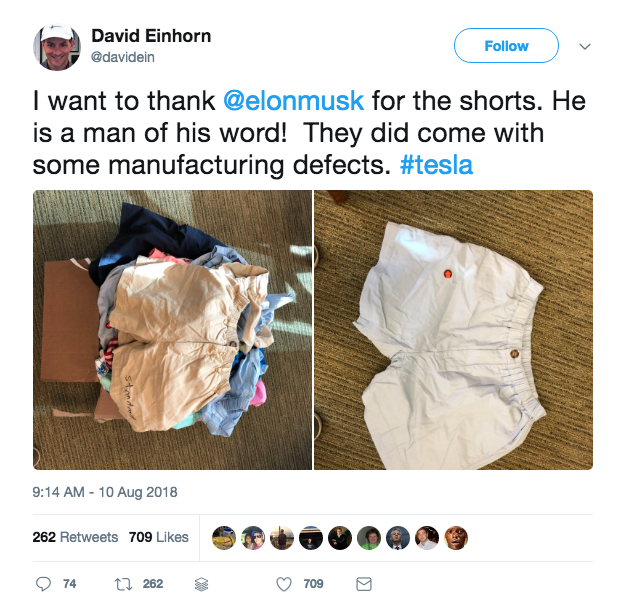 Elon Musk sent short-seller David Einhorn a "box of short shorts to comfort him" after the hedge fund manager blamed Tesla for its dismal l performance. Einhorn, who manages the $5.5 billion Greenlight Capital firm, tweeted a photo of the shorts on Friday. Tesla has had a wild week after Musk announced on Tuesday that he intends to take the company private. 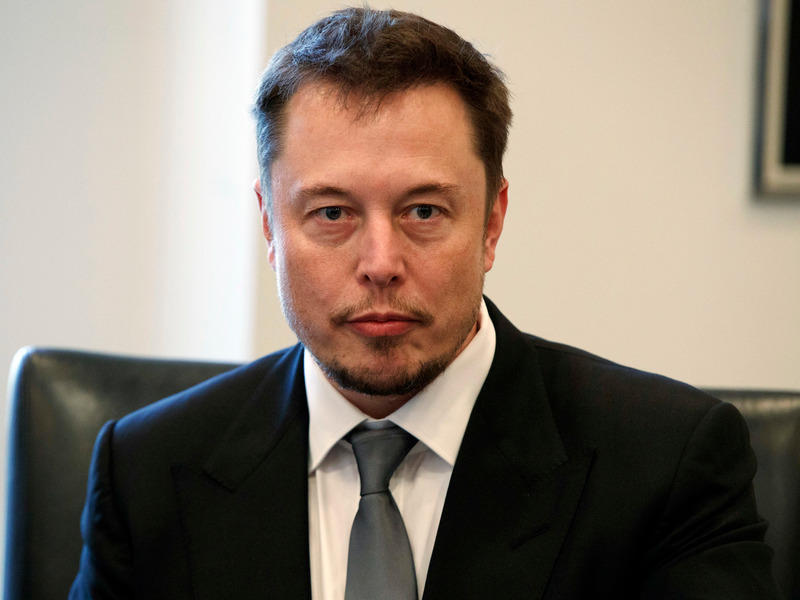 Elon Musk hasn’t been quiet about his disdain for short-sellers. And now Tesla’s chief executive appears to have made good on his promise to send hedge fund manager David Einhorn a "box of short shorts to comfort him through his difficult time" after the billionaire blamed Tesla for his fund's 18.3% decline in the first half of 2018. "I want to thank @elonmusk for the short shorts," Einhorn tweeted Friday morning, “He is a man of his word! They did come with some manufacturing defects. #tesla." Business Insider has confirmed that the unverified account is, in fact, the billionaire hedge fund manager. Einhorn, a noted short-seller, told his Greenlight Capital clients in a July letter that he had abandoned his Tesla Model S reservation in favor of a Jaguar I-PACE electric sedan. He also blamed Tesla’s rising stock price in the first half of 2018 for his fund’s losses, which prompted the mocking tweet from Musk. The short shorts’ appearance comes amid a wild week for Tesla, which was kicked off by a report that Saudi Arabia’s public investment fund had snapped up a roughly 3% stake in Tesla to the tune of around $2 billion. Just minutes later, Musk sent shockwaves through markets when he tweeted that he was “considering taking Tesla private” at $420 per share and that funding had been secured. Shares of Tesla skyrocketed after the tweet, which was accompanied by a copy of the email Musk sent to the entire company. But separate reports from Bloomberg and the Wall Street Journal on Wednesday said the Securities and Exchange Commission was investigating the statements for potential illegality, which took the stock price back below its levels before the tweet. Tesla is down 0.86% in trading Friday and up 9.1% since the beginning of the year. The Turkish lira fell as much as 20% versus the dollar Friday after President Donald Trump said he would double the rates of tariffs on Turkish steel and aluminum. Washington recently imposed sanctions on Ankara over a detained American pastor. Turkish President Recep Tayyip Erdogan called on citizens to convert other currencies and gold into lira. Turkey's currency plunged to fresh all-time lows against the dollar Friday after President Donald Trump announced in a tweet that he would double tariffs on Turkish aluminum to 20% and on Turkish steel to 50%. "I have just authorized a doubling of Tariffs on Steel and Aluminum with respect to Turkey as their currency, the Turkish Lira, slides rapidly downward against our very strong Dollar!" the president wrote on Twitter. "Our relations with Turkey are not good at this time!" The lira dropped as much as 20% against the dollar, its steepest daily drop since at least 2001. It was already one of the worst-performing currencies this year, but a deepening rift between Ankara and Washington has accelerated the sell-off. A Turkish delegation returned from a meeting with Trump administration officials in Washington on Thursday with no apparent progress on a conflict over an American pastor who has been detained in Turkey for nearly two years. Earlier this month, the Trump administration announced sanctions against Turkey for failing to release Andrew Brunson, a 50-year-old evangelical pastor who was arrested in 2016 on suspicion of aiding a failed military coup, claims the pastor denies. The sanctions target Turkey's minister of justice and minister of the interior, whom the White House said played leading roles in the arrest and detention of Brunson. "It is astonishing that no matter how punished the Lira looks, traders are showing absolutely no indication that they are finished with pricing in 'bad news' into the market," Jameel Ahmad, the head of currency strategy and market research at FXTM, said. During a speech in the Black Sea city of Rize overnight, President Recep Tayyip Erdogan called on citizens to exchange hard currencies and gold for the lira. He said the country was facing an "economic war" and blamed the sell-off on credit-ratings agencies and a shadowy "interest-rate lobby," according to Reuters. Erdogan is a self-proclaimed enemy of interest rates and has pushed for unorthodox policies like cutting borrowing costs in the face of accelerating inflation. He had indicated plans to wield more influence over the country's central bank in the run-up to his June reelection. Concerns about the lira seem to already be spreading to other currencies, analysts say, including the pound and the euro. "The issue that global investors now need to take into consideration is that the recipe for a currency crisis in Turkey is now presenting a risk of a contagion knock-on effect across other markets," Ahmad said. Investopedia plans to lay off about a third of its staff, according to a state regulatory filing. The site is owned by InterActive Corp, the brand behind Tinder, The Daily Beast, and more. Follow IAC's stock price in real-time here. InterActiveCorp — the holding company behind OKCupid, Vimeo, The Daily Beast, and more — plans to lay off about one third of the staff at Investopedia, according to a regulatory filing Friday. In a New York State WARN notice dated July 31, the company said the firing of 36 of the financial encyclopedia's 96 employees was due to economic reasons and that the employees were not unionized. IAC's stock price was down about 0.4% in pre-market trading Friday. In an email to Business Insider, Neil Vogel, CEO of IAC brand Dotdash, said the layoffs were due to Investopedia's merger with the former About.com brand. “Investopedia has joined the Dotdash family of brands, bringing together two of the fastest growing scaled properties online, with revenue up 50 and 60 percent respectively for the first six months of the year," he said. "With Investopedia’s audience of financial professionals and students and The Balance’s audience of millennials and women, Dotdash has created a clear market leader in the finance space and is well positioned to serve a broad range of consumers and financial advertisers. Though it’s always difficult to say goodbye to colleagues and friends, these changes allow us to increase our focus on our core media businesses and better position the company for the future." Shares of IAC have risen 41% since the beginning of 2018, fueled by solid bets on dating apps and sites like Tinder, Match.com, Plenty of Fish, and more. It has since spun many of those, including Tinder, to Match Group, in which IAC has a roughly 22% stake. 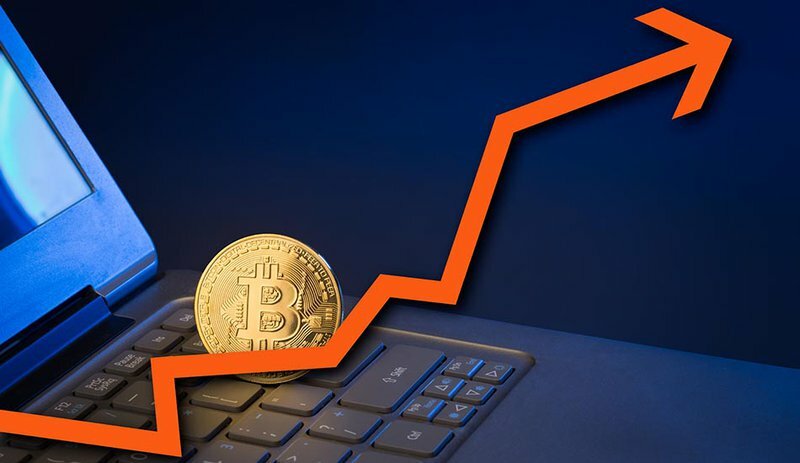 Investopedia saw a massive influx of traffic to its site, especially its explanatory pages about cryptocurrency and blockchain, amid the bitcoin mania in early 2017, its CEO David Siegel told Business Insider in January. At the time, he compared the hype surrounding bitcoin and other alt-coins to the dot com bubble of the 1990's. Representatives for IAC did not immediately respond to a request for comment from Business Insider. The Turkish lira collapsed by over 35% in value versus the US dollar this year — a dramatic and sudden fall. LONDON — Turkey's economy went from being rocky-but-fixable into a full-blown currency crisis today as the Turkish lira collapsed, losing more than 7% of its value against the US dollar on Friday, totaling a drop of over 35% since the same date last year. The crisis may potentially spread beyond Turkey, as Italy's already troubled banks are particularly exposed to the lira. 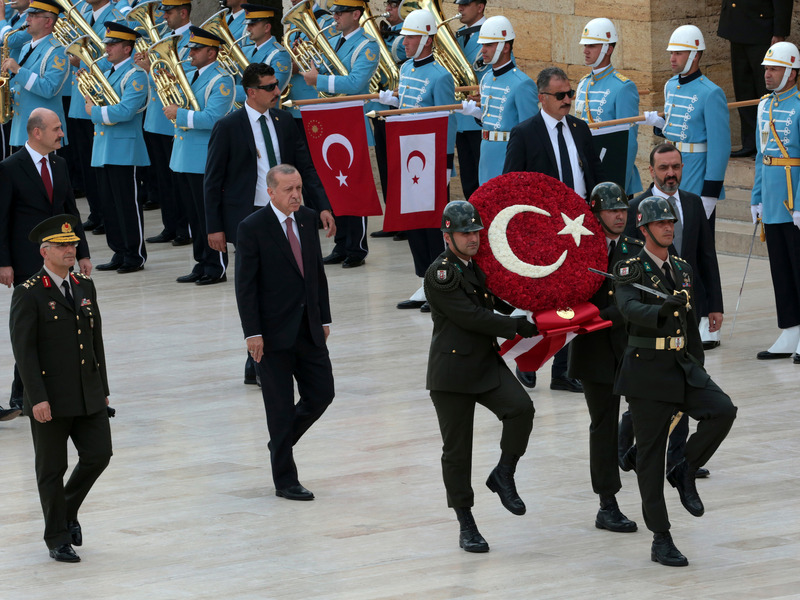 The immediate trigger for the decline was US President Trump's threat of sanctions against two senior Turkish ministers, in protest at the country's imprisonment of Andrew Brunson, an American Christian pastor jailed on accusations that he is linked to the Gulen movement, which opposes Turkey's current government. But the actual sanctions imposed — freezing assets of a handful of Turkish officials — are not enough to tank an entire currency. GDP growth in Turkey is robust — it was 7.4% in the first quarter of 2018 and 7% in 2017. (For comparison, annual GDP was only 2.3% in the US and 1.8% in the UK). The track record suggests that President Recep Tayyip Erdogan fundamentally misunderstands the role of central banks in setting interest rates to combat inflation, and it is this error that is fuelling the bonfire of lira right now. In basic terms, if you have rising inflation then a country's central bank needs to increase interest rates to drive prices down again. The higher your inflation, the higher rates need to go to combat it. But in Turkey, inflation is currently running at 16% — an astonishingly high level for a modern European country. Most Western free-market countries aim to keep inflation at or below 2% per year. With inflation rampant, Turkey's central bank had been expected to raise interest rates again. But in July it held them, at 17.75% (which must, admittedly, seem already punishingly high for Turks grappling with raging consumer price increases). 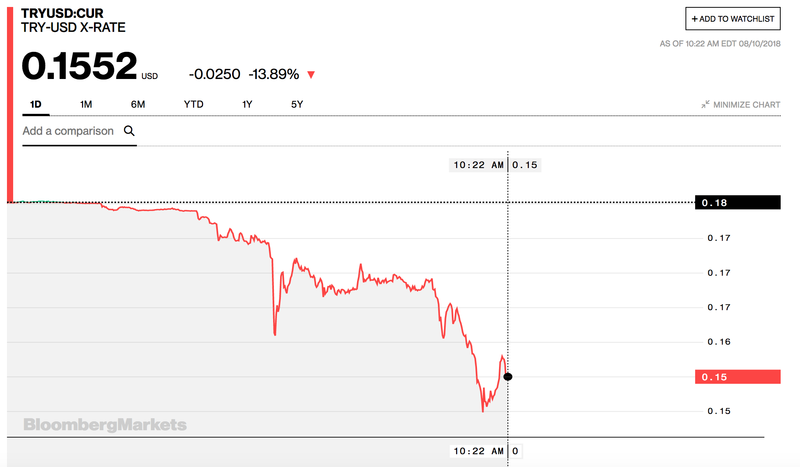 That was the exact opposite move the markets wanted to see — it signalled that Erdogan's central bank is not serious about controlling inflation and thus the price of the lira. “If my people say continue on this path in the elections, I say I will emerge with victory in the fight against this curse of interest rates,” Erdogan said in a speech to business people in Ankara, referring to snap elections on June 24. In July he appointed his son-in-law, Berat Albayrak, to run the central bank. Albayrak told Turkish TV, “We will see inflation and interest rates decline in the coming period,” but then he did nothing with interest rates. As the Financial Times put it, "Many see this as a sign that Erdogan’s takeover of the country's monetary policy is complete." Erdogan is a conservative Muslim intent on turning his country away from the West and back toward Islam. In that religion, charging interest on debts is regarded as "riba," or usury, which is therefore "haraam" (sinful or prohibited). Thus it may well be that when Erdogan describes interest rates as "evil" he is speaking literally not figuratively. The problem for Turkey is that its economy has grown at a fast pace in recent years. This, generally, is a good thing and one of the reasons Erdogan won re-election this summer. But a fast-growing economy tends to drive prices higher, as demand outstrips supply. High inflation can kill an economy by making its currency worthless — no one wants to use it if its value tomorrow is a fraction of its value today. Currencies only tend to hold their value when prices are stable. The only way to maintain the value of the lira is for the Turkish central bank to sell government bonds and increase the rate of interest it offers for anyone who wants to hold them. In so doing, the bank would take in lots more lira — thus removing currency from the market. Like any commodity, a reduced supply of lira would increase its value and stabilise its price. Unfortunately, Erdogan and his son-in-law are doing the opposite: By leaving the interest rate alone they have signalled to the market that the exchange price of lira won't stabilise anytime soon. In July, when the bank failed to act, Albayrak said, “We will see inflation and interest rates decline in the coming period.” Either Erdogan and Albayrak don't understand what they need to do to get the crisis under control, or they regard interest-rate setting as so evil they would rather live with the consequences. There have been two infamous occasions in history when governments attempted a similar miracle to what Erdogan and Albayrak are hoping for today. One was the Weimar Republic of 1919 to 1933, when the German government printed money to pay its debts, with disastrous consequences. The other was the US in the 1970s, when US Federal Reserve chairs Arthur Burns and William Miller kept interest rates low because, as businessmen, they just liked low interest rates. The US economy went through a 10-year period of "stagflation" — high inflation and repeated recessions — as a result. Crypto newbies from around the world are now using their old laptops to earn bitcoin, according to statistics from the firm. The Turkish lira continues its plunge. It hit an all-time low against the dollar on Friday after the European Central Bank said it was concerned about lenders' exposure to Turkey. A Turkish delegation in Washington had failed to prevent US sanctions over the arrest of the American pastor Andrew Brunson. 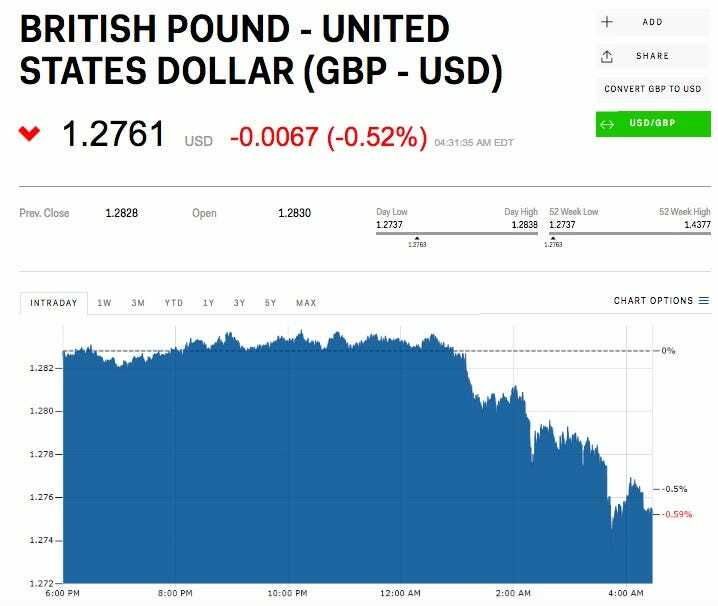 The pound is still falling, too. It hit a fresh 11-month low against the dollar after data from the UK Office for National Statistics showed faster second-quarter gross-domestic-product growth but a manufacturing recession. Russia says US sanctions on banks or foreign currency dealings would be a declaration of 'economic war.' The US on Wednesday announced a new round of sanctions targeting Russia that pushed the ruble to two-year lows. Dropbox beat on 2nd-quarter earnings and announced a key executive was stepping down. Dropbox's chief operating officer, Dennis Woodside, long considered a key lieutenant to CEO Drew Houston, is leaving the company. Tesla's board reportedly may tell Elon Musk to recuse himself from talks about taking the company private. The board has told Musk he must consult different advisers as they seek counsel, CNBC reported. Tesla is now worth less than it was before Musk's $420 tweet. 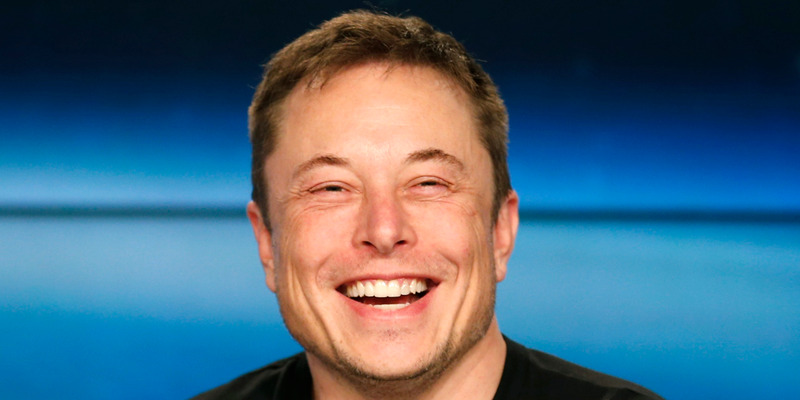 The stock closed down 5% Thursday at $352.45; it was worth $358 when Musk tweeted Tuesday about taking the company private. 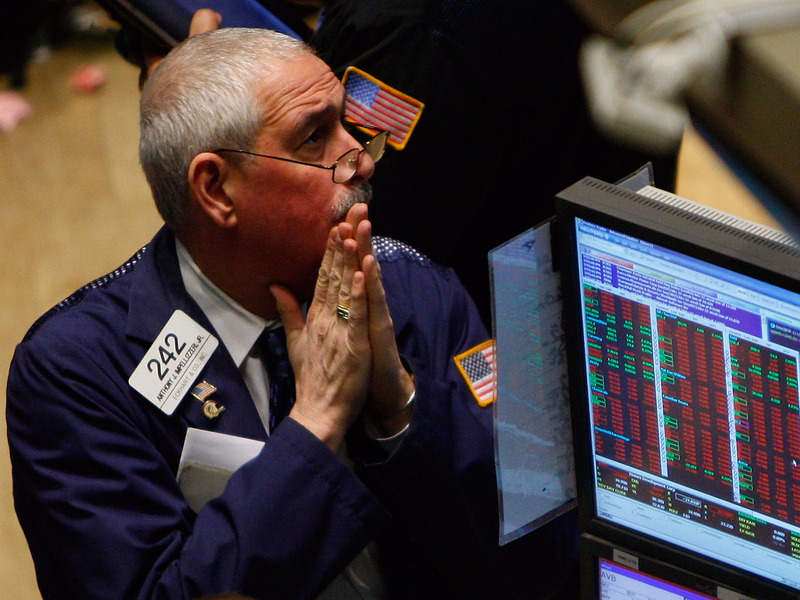 Bank of America asked 65 investors their biggest fear — and the top response shows just how vulnerable markets are. A sharp loss of liquidity is now their biggest worry. Samsung unveils its Galaxy Note 9 and its answers to the Apple Watch and the HomePod. The company announced a slew of new products at an event in Brooklyn, New York, on Thursday. Inflation numbers are on deck. The July consumer-price index will be released at 8:30 a.m. ET. Global equity markets are in the red. Dow futures are down 0.4%, or 106 points. The 10-year yield is down 4 basis points at 2.895%. The bitcoin market has turned indecisive in the last 24 hours and today's UTC close is expected to set the tone for the next move in prices. The Turkish lira has fallen more than 10% against the dollar after a Turkish delegation in Washington failed to prevent US sanctions. There are concerns that contagion could spread to Europe. The euro dropped below 1.15 against the dollar on Friday. 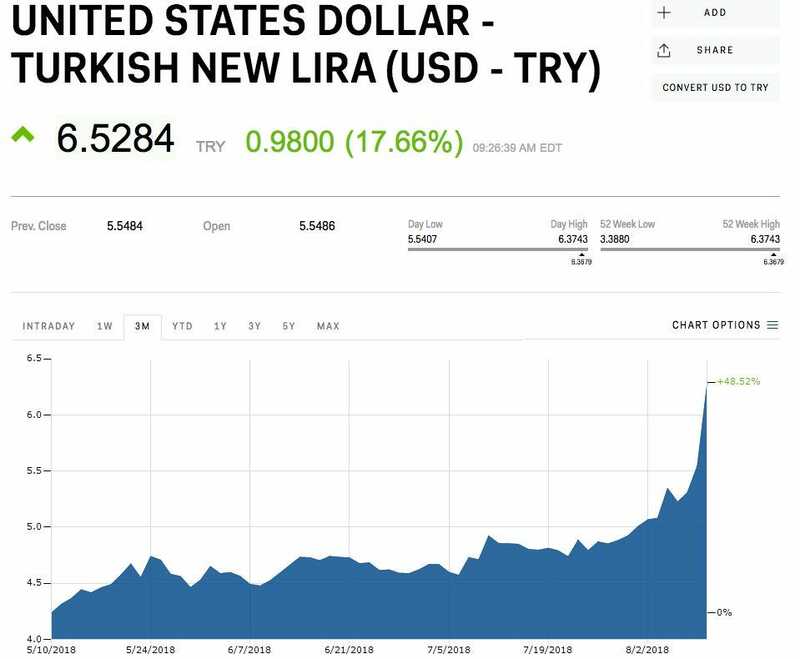 "[The lira] is falling so fast that a parachute is the first thing that comes to mind to prevent the lira smashing into the ground," Bart Hordijk, Market Analyst at Monex, Europe told Business Insider. Turkish President Recep Erdogan and his newly appointed finance minister Berat Albayrak are due to speak at 2 p.m. local time today. You can follow the lira price live on Markets Insider. The Turkish lira hit an all-time low against the dollar on Friday and there are growing concerns that the country's economic troubles could spread to the eurozone. The lira fell 7% against the dollar to $5.9655 on Friday morning after hitting an all-time low earlier in the session. The overall drop for the year to date is over 35%. 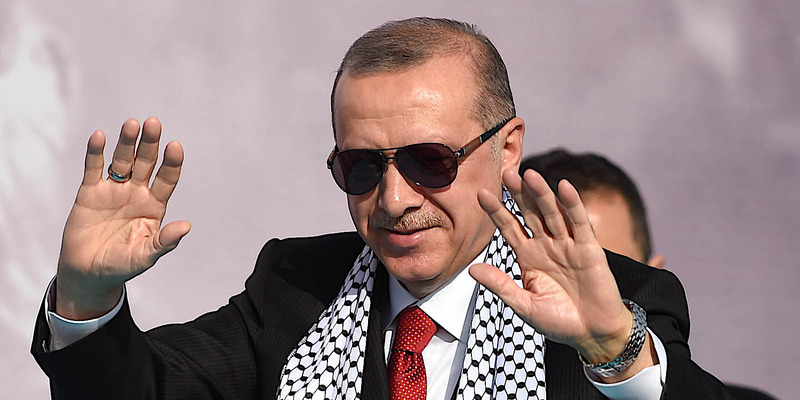 The fall has come as Turkish President Recep Erdogan has moved to take greater control of monetary policy. The recent plunge comes after the Turkish delegation in Washington failed to stop the US from imposing sanctions against two senior ministers. The lack of central bank action to support the currency is also spooking investors. 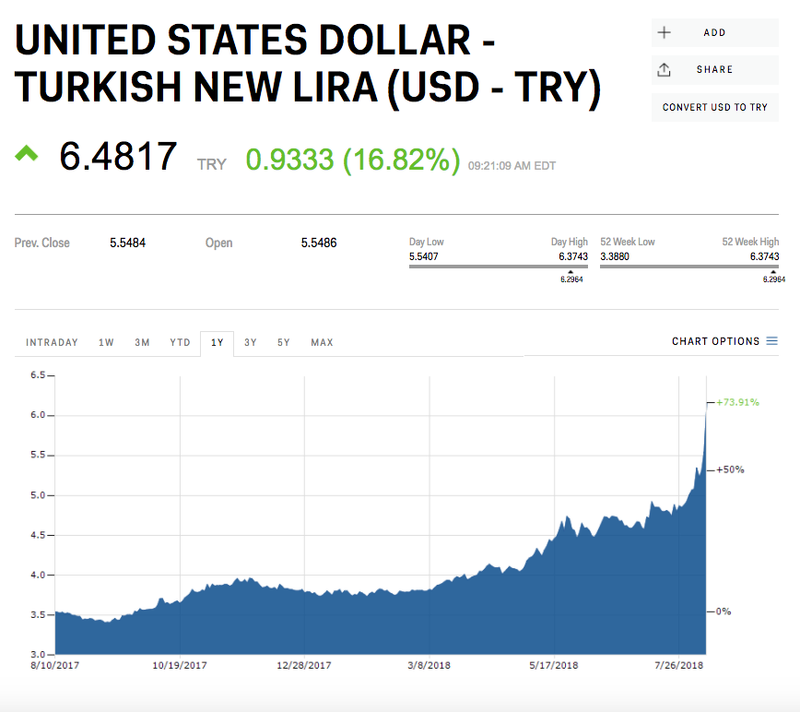 "[The lira] is falling so fast that a parachute is the first thing that comes to mind to prevent the lira smashing into the ground," Bart Hordijk, a market analyst at Monex Europe, said in an email. Concerns are mounting that the decline will start to hit European banks. The Eurozone’s chief financial watchdog has become increasingly concerned about the exposure of some of Europe's biggest lenders to the country. They include BBVA, UniCredit and BNP Paribas, and the exposure to those lenders is being closely watched, the Financial Times reported. The risk of contagion saw the euro fall by 0.5% against the dollar to $1.1471 at 10.15 a.m. BST (5.15 a.m. ET) on Friday. Turkish President Recep Erdogan and his newly appointed finance minister Berat Albayrak are due to speak at 2 pm local time today. Erdogan has promised a new economic model driven by his son-in-law and new finance minister Albayrak. 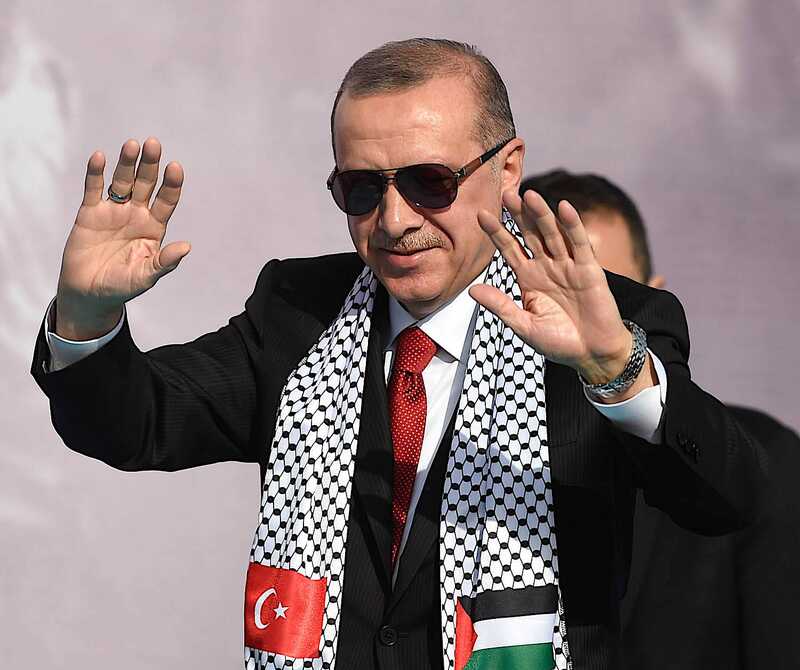 Erdogan spoke briefly on Thursday night and alluded to problems with the currency, saying that "various campaigns" are underway, adding: "If they have dollars, we have our people, our righteousness and our God." A "gigantic rate hike" of at least 500 basis points to calm markets and a clear commitment from the Central Bank of Turkey to support the currency could help halt the decline, Hordijk said, adding: "Another bandage to stop the lira from bleeding to death would be capital controls, but Erdogan opposes these measures. "A painful admittance that his powers are outmatched by the forces of markets and that he may have misjudged the economic situation may be a lot to ask of the autocratic leader Erdogan, but the alternative is that the lira will meet the ground at terminal velocity; an impact that will damage the Turkish economy for years to come," he said. UK GDP estimates in-line: a quarterly growth of 0.4% and annual growth of 1.3%. The figures failed to revive the pound, which hit a fresh year low against the dollar on Friday morning. Sterling is suffering from "no deal" Brexit fears and a strong dollar. 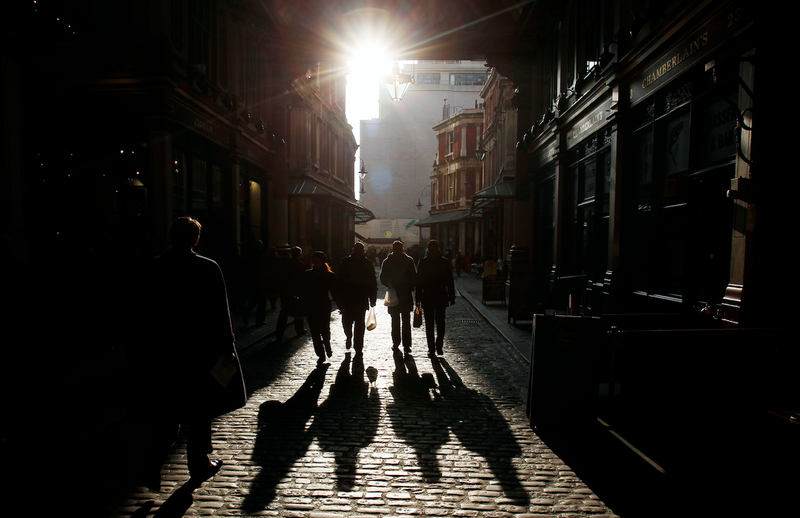 LONDON — In line UK GDP growth in the second quarter failed to revive the bombed-out pound on Friday. The UK Office for National Statistics said on Friday morning that its preliminary estimate for UK GDP growth in the second quarter was 1.3%, in line with economists' forecasts and up from 1.2% in the first quarter. Quarter-on-quarter growth came in at 0.4%, in line with consensus forecasts and up from 0.2% in the previous quarter. The figures failed to do much to reverse the poor performance of the pound on Friday. Sterling has been under pressure all week amid rising fears of a "no-deal" Brexit. A rallying dollar put more pressure on the currency. The dollar index, which measures the currency's strength against a basket of others, hit its highest level since June 2017 on Friday. The pound was down 0.5% against the dollar to $1.2761 at 9.31 a.m. GMT (5.31 a.m. ET), a minute after GDP figures were released. It marks a fresh 11-month low for the pound against the dollar. 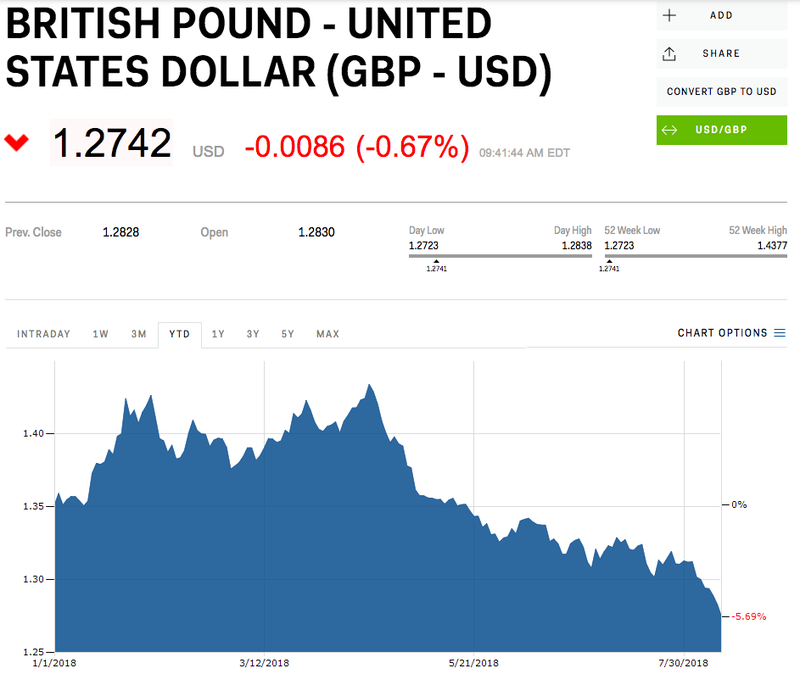 "The fears of a no-deal Brexit have piled the pressure on the pound and the dollar’s rally has come as a sucker punch," Neil Wilson, the chief market analyst at Markets.com, said in an email. The pound was up around 0.11% against the euro at the same time. The euro is suffering amid concerns about possible contagion from Turkey's economy and currency spreading to eurozone banks. 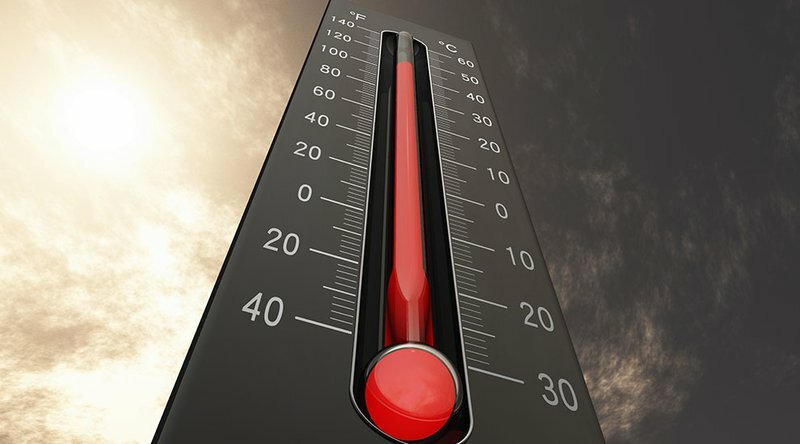 Connor Campbell, a financial analyst with SpreadEx, said: "That the pound managed to nudge higher against the euro, alongside the single currency’s own 0.7% slide against the greenback, suggests Friday’s fall is a tad more informed by trade war-fearing investors pouring into the safe-haven dollar than the week’s ‘no deal’ Brexit concerns (though that undoubtedly isn’t helping)." 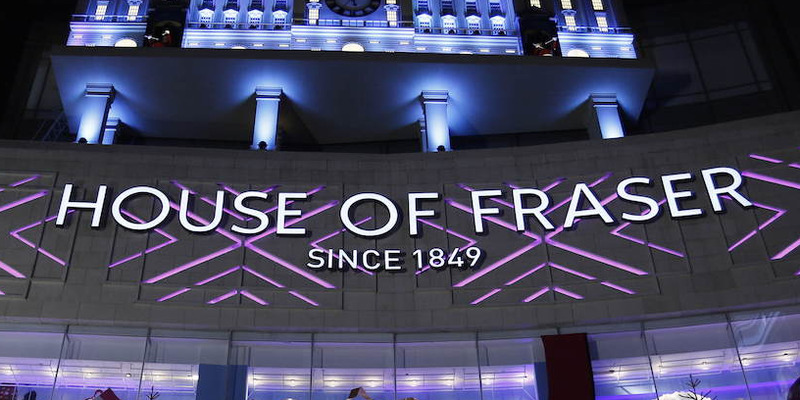 The 169-year-old UK department store House of Fraser has fallen into administration after failing to secure a rescue deal. The Chinese-owned company has struggled with falling sales in recent years and now has debts larger than its assets. Accountants EY has been appointed to find a buyer for a business. Sports Direct billionaire Mike Ashley is said to be a front-runner. House of Fraser employs 17,500 people across the UK. Even if a buyer is found, some of these jobs could be at risk. LONDON — Beleaguered UK department store House of Fraser on Friday called in administrators after failing in its attempts to negotiate a rescue package or sale of the business. House of Fraser said in a statement on Friday that talks with investors and creditors had "not concluded in a solvent solution." EY, one of the "Big Four" accountants, have been appointed as administrators. House of Fraser, which employs 17,500 people across nationwide, will continue to trade while EY tries to find a buyer for part or all of the business. Companies fall into administration in the UK when they become insolvent, with debts larger its assets. Administrators are appointed to take control of the business and act in the best interest of creditors, realizing value by selling the business part or whole. 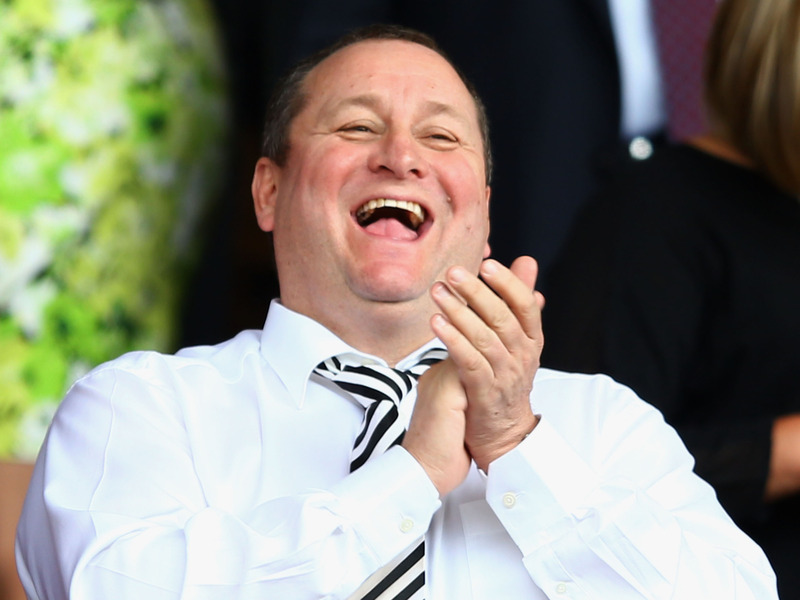 Sky News reports that Sports Direct billionaire Mike Ashley is an early front-runner to buy the business. House of Fraser said in its statement: "Significant progress has been made towards completing a sale of the Group’s business and assets. The proposed administrators are expected to continue to progress those discussions with a view to concluding a transaction shortly after their appointment." If a buyer cannot be found, EY will likely shutter the company and liquidate its assets. Even if a buyer can be found, jobs may be lost in the process. Richard Hyman, an independent retail analyst, told Business Insider: "Whatever happens, you can see that House of Fraser’s staff are the last to be informed and this morning, don’t really know what their future is. It’s a very shabby way to treat people and bad news for the wider economy." House of Fraser, which was founded in 1849 in Glasgow, has been at risk of toppling for several months. The department store's Chinese owners tried to seal a rescue deal earlier this month that collapsed, leaving House of Fraser in a precarious position. The company also faced an extended battle with landlords to try and reduce its rents and buy more time. House of Fraser was acquired by Chinese group Sanpower for £450 million in 2014, but the chain has struggled since then. House of Fraser lost £9 million last year and sales over the crucial Christmas period fell by 2.9%. The company has a £400 million debt pile. Mark Williams, the president of retail property organisation Revo, said in a statement earlier this week: "House of Fraser is a business that has been under-invested in for many years and that’s the ultimate reason for its failure." The collapse of House of Fraser follows the demise of fellow department store BHS in 2016. The UK is facing an extended slump in retail sales this year and department stores have been particularly badly hit. Debenhams, another UK department store, announced an 85% collapse in profits in April. Frank Slevin, chairman of House of Fraser, said in a statement: "This has been an extraordinarily challenging six months in which the business has delivered so many critical elements of the turnaround plan. Despite the very recent termination of the transaction between Cenbest and C.Banner [the collapsed rescue plan], I am confident House of Fraser is close to securing its future." Hyman said: "There will be more retail casualties — we are only really in the early stages of a huge shake out." 1. Asian stock markets fell on Friday amid heightened global trade tensions, while currency markets were whipsawed by a searing sell off in Russia's rouble and as economic worries sent the Turkish lira tumbling. Washington said it would impose fresh sanctions because it had determined that Moscow had used a nerve agent against a former Russian agent and his daughter in Britain, which the Kremlin denies. 2. The pound's extended slump continued on Friday as it fell to a fresh low against the dollar. Sterling is down 0.27% against the dollar to $1.2792 at 7.30 a.m. BST (2.30 a.m. ET), marking a fresh 11-month low. 3. Russia would consider it an economic war if the United States imposed a ban on banks or a particular currency, Prime Minister Dmitry Medvedev said on Friday, the TASS state news agency said. "I would not like to comment on talks about future sanctions, but I can say one thing: If some ban on banks' operations or on the use of one or another currency follows, it would be possible to clearly call it a declaration of economic war," Medvedev said. 4. Investors are pulling billions of dollars out of Europe. Investors have pulled $35 billion from European equities this year and $51 billion from European funds, according to Barclays data. 5. Mobile chipmaker Qualcomm is settling an antitrust case brought against it by Taiwan regulators by paying T$2.73 billion ($89 million), the island's Fair Trade Commission said on Friday. The commission said Qualcomm also agreed to bargain in good faith with other chip and phone makers in patent-licensing deals. 6. A divided federal appeals court on Thursday ordered the US Environmental Protection Agency to ban a widely-used pesticide that critics say can harm children and farmers. The 2-1 decision by the 9th US Circuit Court of Appeals in Seattle overturned former EPA commissioner Scott Pruitt's March 2017 denial of a petition by environmental groups to ban the use of chlorpyrifos on food crops such as fruits, vegetables, and nuts. 7. Blockchain company Soluna plans to build a 900-megawatt wind farm to power a computing center in Dakhla in the Morocco-administered Western Sahara, its chief executive John Belizaire said in an interview.Work on the initial off-grid phase will start in 2019 and complete a year later, with the possibility of connecting the site to the national grid, Belizaire told Reuters. 8. Ryanair is bracing for its biggest-ever one-day strike on Friday with pilots based in five European countries set to walk out, forcing the cancellation of about one in six of its daily flights at the height of the holiday season. Ryanair, which averted widespread strikes before Christmas by agreeing to recognize unions for the first time in its 30-year history, has been unable to quell rising protests since over slow progress in negotiating collective labor agreements. 9. Mercedes-Benz sports utility vehicles built in Tuscaloosa, Alabama, are being checked for potential problems by Shanghai customs authorities, Daimler confirmed on Thursday. Mercedes-Benz GLE and GLS models, built in the United States between May 4 and June 12, 2018, have a brake issue which poses a "safety risk," according to a Chinese customs document circulating on Chinese social media. 10. Dropbox reported its second-ever earnings as a public company on Thursday. The company beat Wall Street's expectations on revenue and earnings per share but the stock slid on news of Chief Operating Officer Dennis Woodside's impending departure. Bitcoin's price rose above $6,500 today, offering some respite for the badly battered bulls.